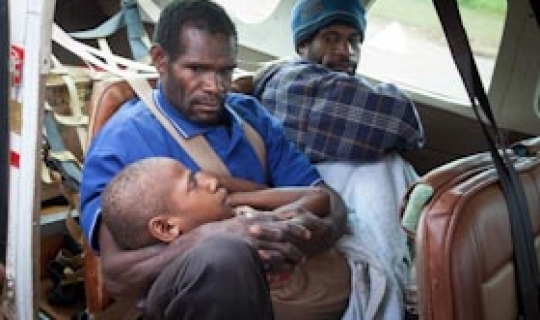 “It’s bittersweet,” said Dave Mueller, thinking of his little grandkids halfway around the world, living among the Maliyali people of Papua New Guinea. He took his first flight because he wanted to learn to fly. On March 4, 2019, he took his “last flight” to meet the Savior he loved and served with his life. … as the day wore on …., [they] had to get down to the nitty gritties of life. Who wants a promise broken? Even worse, who wants to break a promise? But sometimes its unavoidable. Engine in! Propeller on! Fly! Finally, the Kodiak was ready. 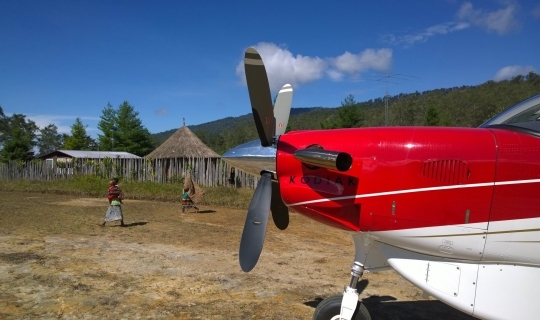 One of our Ethnos360 Aviation pilots flew “NTZ” from the remote airstrip back to our hangar in Goroka. 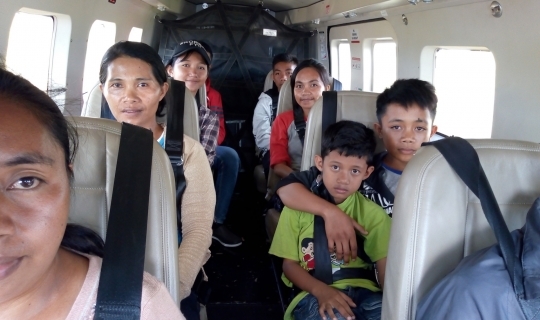 Ethnos360 Aviation along with other mission organizations collaborated to evacuate all our affiliated personnel and school children to safe cities. Missionary Ed Casteel was about to discover a strange connection. While the initial earthquake and tsunami are over, there have been hourly tremors that continue to shake the land. The dreaded word – Tsunami! 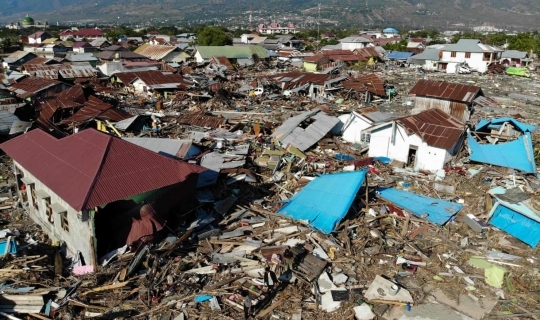 For some people, the thought of a tsunami is their worst nightmare. 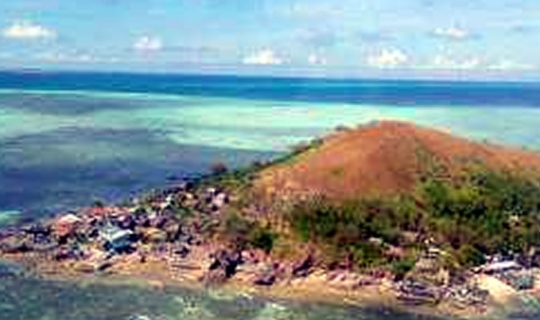 … For the people of Sulawesi, it’s a reality. 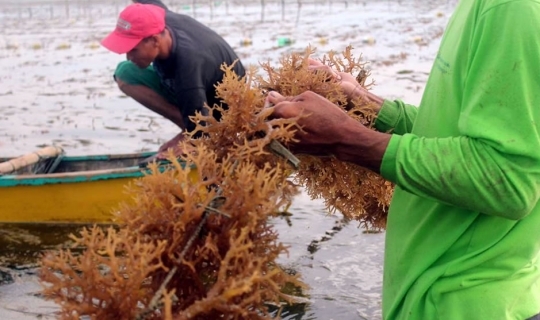 Philippine Typhoon: Prayers Answered. Ready to Work! Thanks for your prayers! 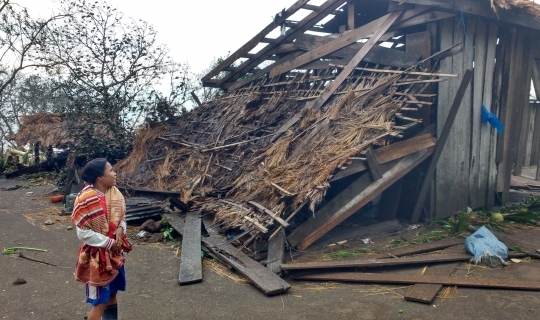 Typhoon Mangkhut came with fury and whipped over the northern end of Luzon Island in the Philippines Friday and Saturday. 2019 gives us cause to celebrate and much to thank God for! Learn more in our 2019 calendar. New House, New Outreach, New Baby! Every day, marvelous things happen because of your solid backing in prayer and partnership. Here are just a few glimpses of how God is working through you. 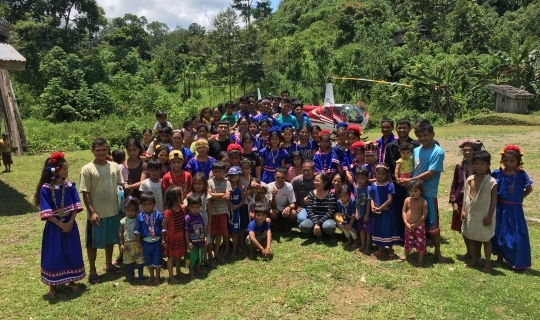 The Banwaon believers are building elementary schools in two communities with the help of the government and Ethnos360 Aviation. 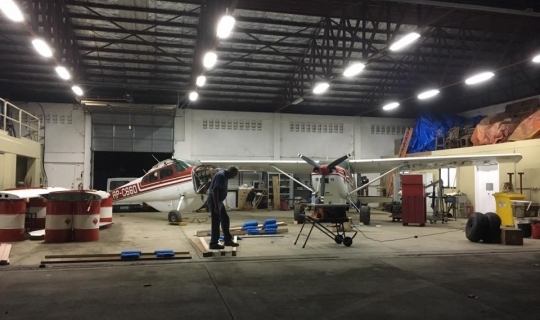 August 9, Papua New Guinea time, two Ethnos360 Aviation pilots were involved in an incident with one of the Kodiak aircraft. You’d have to wonder which was worse – the intense pain of appendicitis or the despair of knowing that surgery was ten hours away. Not Your Ordinary Day in the Office! The doctor sat down at the battered school desk to begin his day in the clinic. 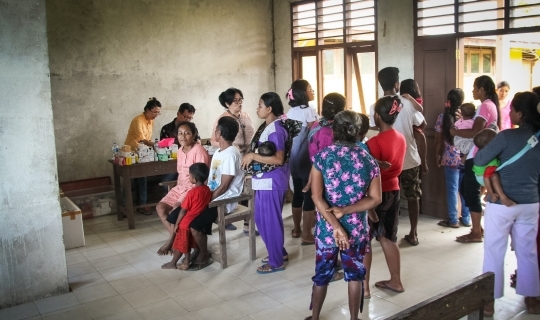 In a Tala-andig outreach village, tragedy struck. Mantunhayan, the main missionary, had been hit in the head by a falling tree and lay unconscious. Why is the Earth Shaking? 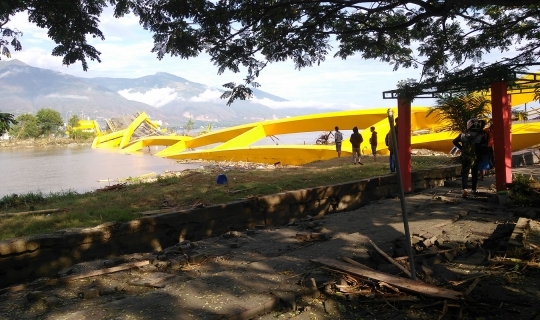 Earthquake after earthquake rocked the highland region of PNG starting on February 26. 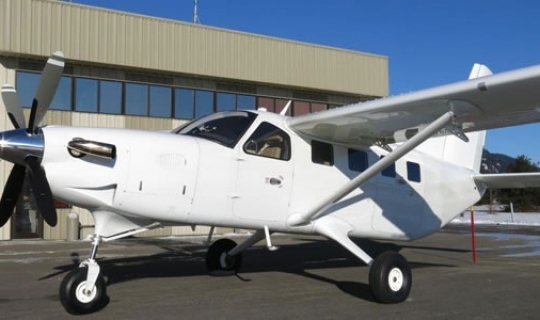 With the ink barely dry on the new “operator’s certificate,” pilot Nomad Nelman took to the skies in the Kodiak airplane. 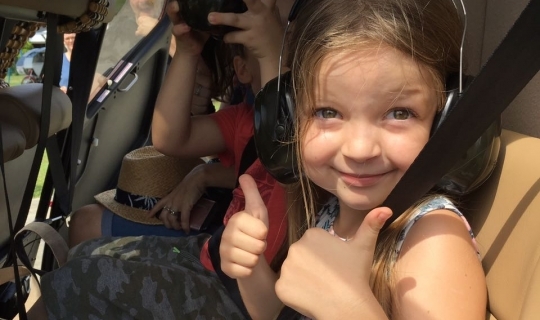 “Eye opening!” “Outstanding!” “Fantastic!” It was more than just airplanes and helicopters that brought those comments at our 2018 Ethnos360 Aviation Expo. Never had the Tala-andig been able to gather like this. 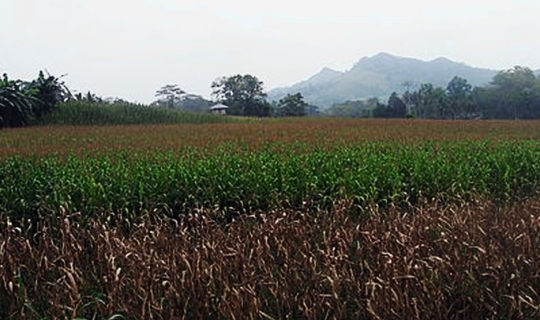 The terrain was just too rugged, and the villages had no airstrips. You probably won’t be surprised to hear that we are changing our name! There’s nothing like an honest look in the mirror to tell you what’s really going on. At least for tonight, they managed to get to shore, where they spent the night in a barge moored along the bank. Aviation maintenance specialist Imie Mark knows it’s about more than turning wrenches on an airplane. All they wanted was a vacation ... What they got was disaster! 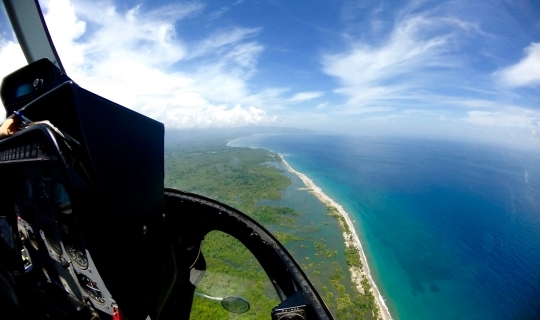 NTM Aviation helicopter pilot Brian Pruett felt a bit of exhilaration. 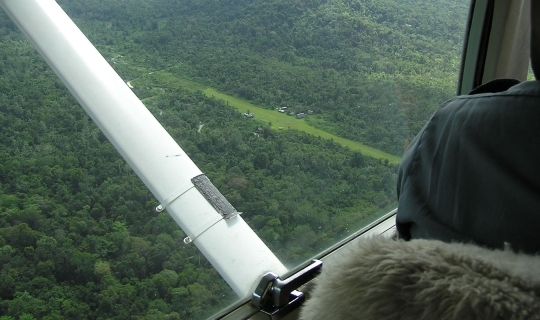 The pilot's wife is one of the first to hear how God is at work in the remote areas where we serve. The Time is Right -- Again! 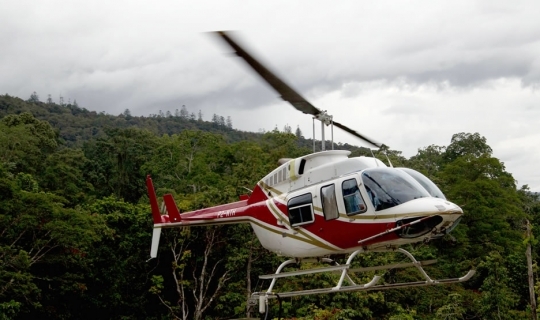 The R66 helicopter had its first few operational flights and the timing was perfect! Josh Dalton reported, "It's like Christmas in June! Unpacking and organizing spare parts and tools [for the R66]." The Happiest Man on the Island! The Helicopter is Landing Here? 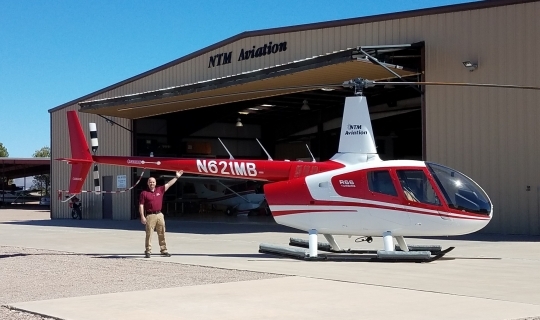 The good news is that today, April 19, the NTM Aviation crew in McNeal, AZ, packed the Robinson R66 helicopter into a shipping container, bound across the ocean. “I Do!”: We Are Faithful! 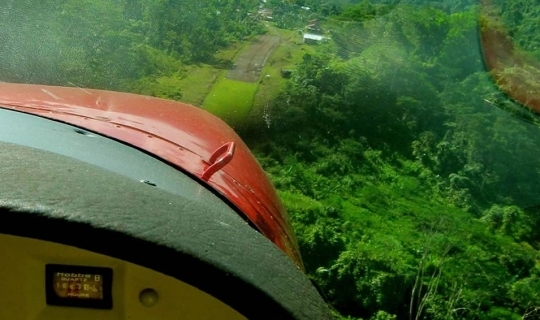 As pilot Daren Spence walked down the path Sunday morning in the Taliabo village, he smelled moth balls. Why? 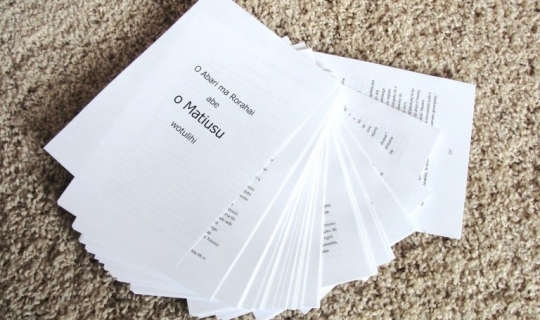 What happens when the visiting translation consultant has to leave — but the translation check is not finished? Have you taken a long trip lately? You sure want to be prepared and not forget anything. 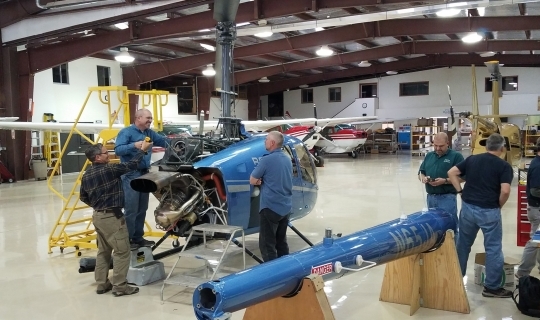 Within hours of its arrival, zealous NTM Aviation mechanics started dismantling the blue R66. 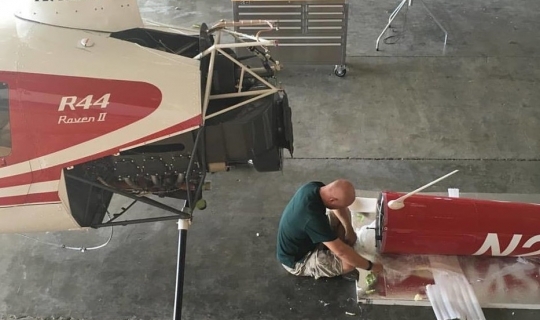 Why take apart a perfectly good helicopter? “Grandfather” had rejected the Gospel. In fact, he was so adamant about his stance that he moved to a Wana village with others who also didn’t want anything to do with the Gospel. 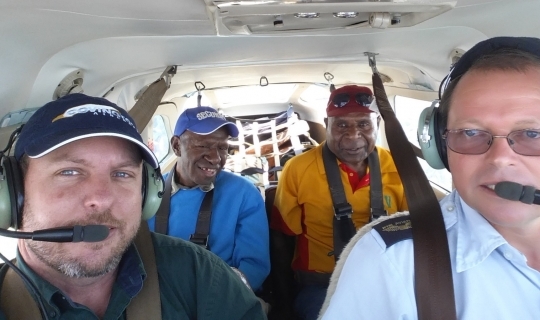 Two remarkable milestones have taken place in the last month with our NTM Aviation team in PNG! Don't you wish things would happen right when you want them to? The boat crew nearly threw all the construction supplies overboard to save themselves from sinking. Not that many years ago, the Wana were ordinary tribal people, just learning that the Creator God was greater than all the spirits they tried to appease every moment of their lives. What if you had never been to a dentist in your whole life – and all your problems festered and caused infections and pain? 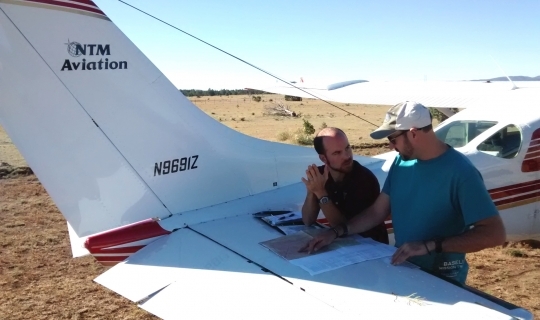 As part of the training, NTM Aviation trainees did a 3-day-long cross country flight in New Mexico, using back country airstrips. 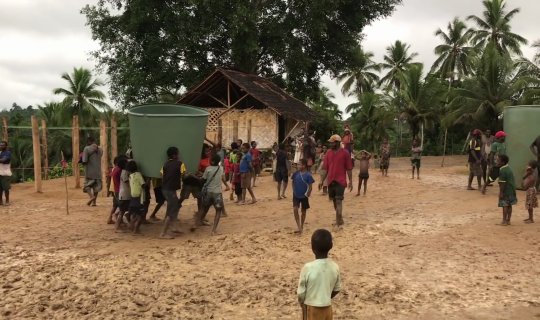 Most of their own roof was ripped off, allowing salt water and sand to drench their house. 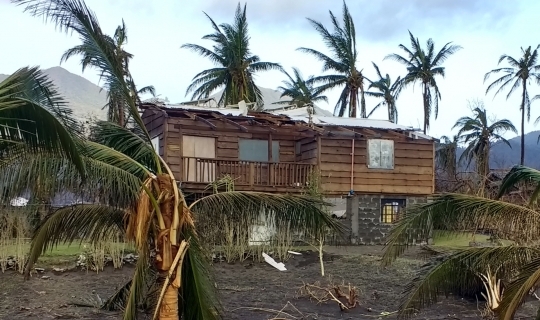 “Many of our co-workers had a long night last night and into the day,” wrote NTM’s field leadership in the Philippines as Typhoon Haima moved on. 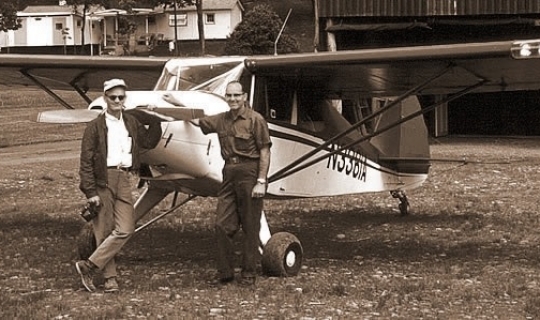 It was an honor to be part of closing a great era of missionary aviation. Haima was the equivalent of a Category 4 hurricane as it came ashore. One helicopter delayed - another one delivered. Often Ace and Ang play a behind-the-scenes role in ministry, quietly helping and enabling others be successful in what God has called them to do. In John and Jessi George’s book, the Kodiak spells survival -- in more ways than one. To live reasonably comfortably in this tropical island village, fans and lights are quite handy. 4 hours over water, mountain wave, and a constant battle with rain showers all day due to a typhoon in the North. It was a fight all day but so worth it! Awestruck is the word missionaries used to describe the Tugutil people as they watched the Kodiak land for the first time in their village. 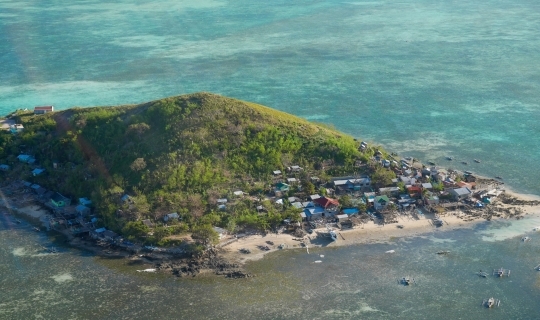 Philip and Vina Le Roux have had some hair-raising travel experiences as they reach out to the Agutaynen people on a remote and isolated island in the Philippines. When both Grandmas visit the tribe, the entire family gets really excited. Then an emergency happens to one of them. What next? 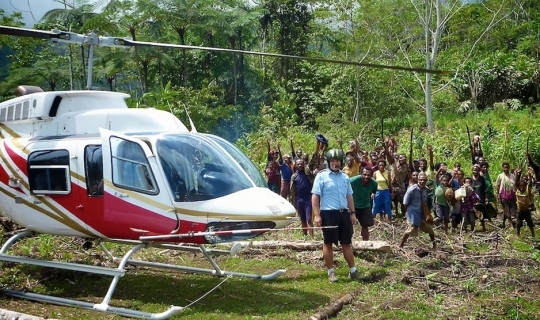 How humbling that in the middle of these very remote mountains in PNG, a group of believers were praying for my recovery. Why another helicopter? 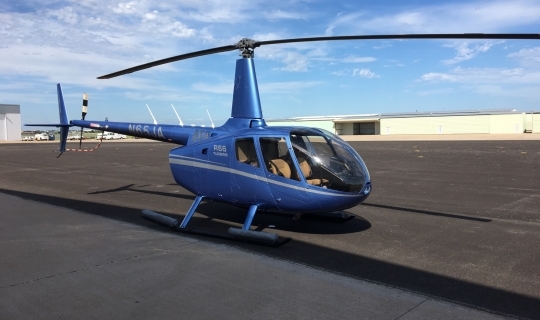 The R44 that just arrived has always been intended as a temporary solution until we could purchase an R66. The children came running up to the plane, lovingly stroking and patting their hands over every surface they could reach. 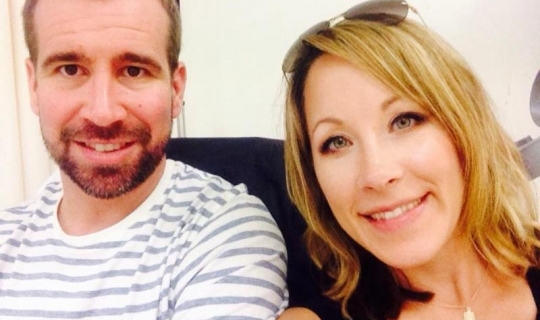 “They love the plane,” says pilot’s wife Ruth Patton. 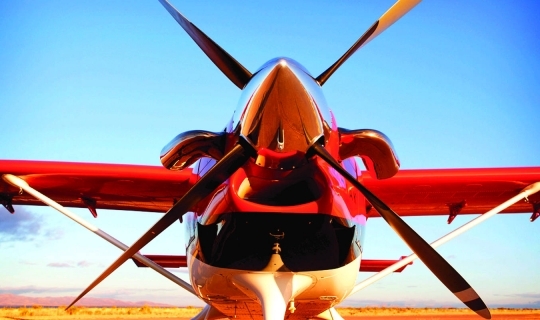 NTM Aviation has made great leaps into the 21st century. Are you ready to keep in step? 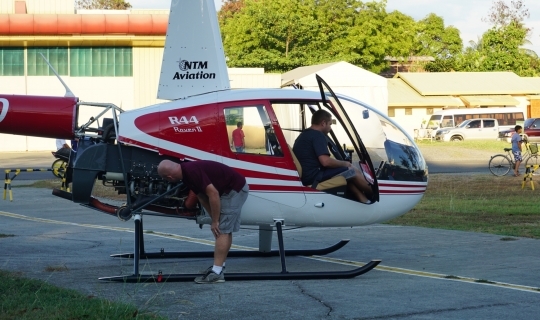 Pilots with NTM Aviation have a role much larger than simply flying or working on aircraft. 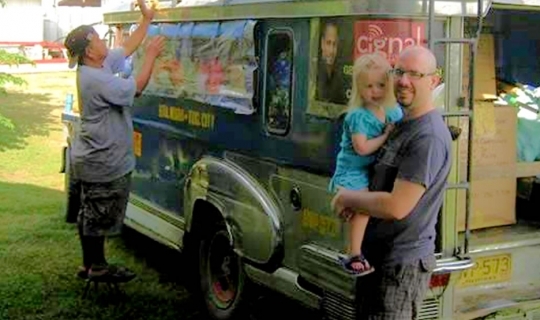 From Indiana to Panama to the Asia-Pacific region on a quest to see Christ proclaimed everywhere. 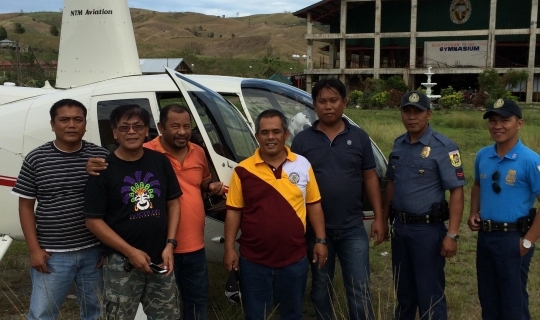 God just gave NTM Aviation an R66 helicopter for the Philippines! You prayed, you gave, and God supplied. It's hard to believe it really happened! 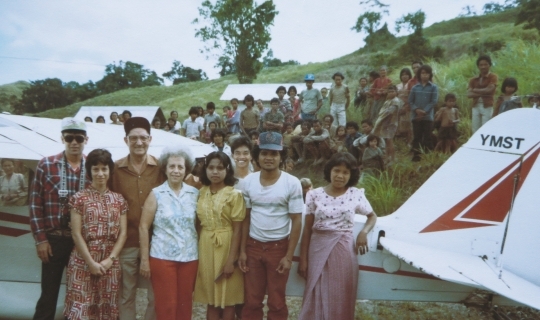 Linda Krieg credits not only flights but pilots for helping her work among the Siawi people. 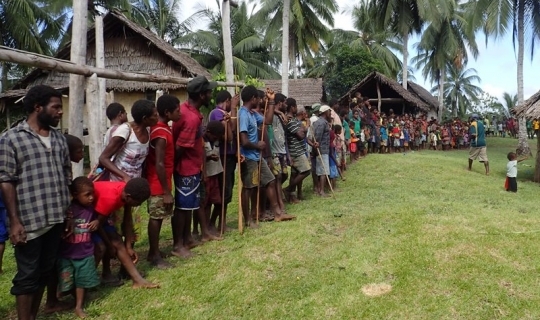 Twenty years previous, no one in this tribe knew Jesus. But they recounted how God had carefully prepared them to hear. When the message came, they were ready. Now each in turn told his story of belief. 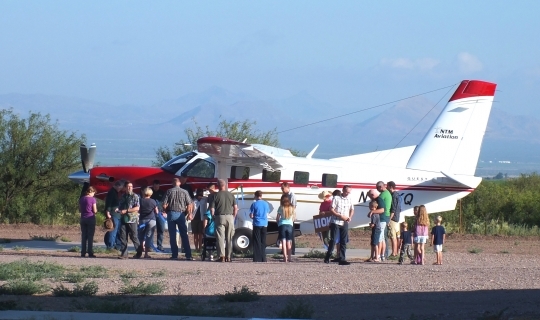 A flight is coming to your remote ministry location. You’ve waited four months for this day...And then you wait. The flight is canceled for weather. 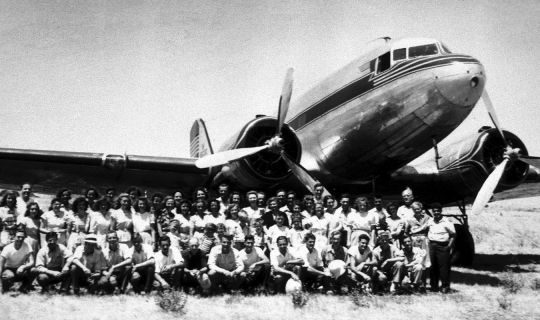 Founder Paul Fleming recognized the value of missionary aviation early in the mission’s history. 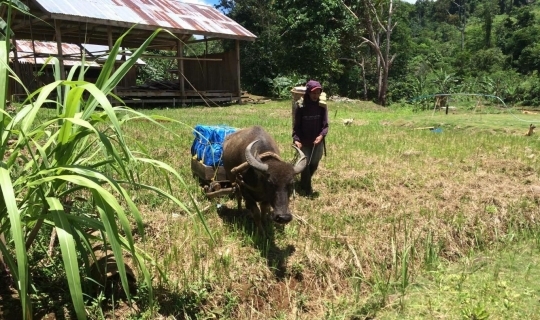 “From headhunters, they are now soul hunters.” That’s how Filipino missionary Rene Tanjusay characterizes the Ilongot tribal people of the Philippines. 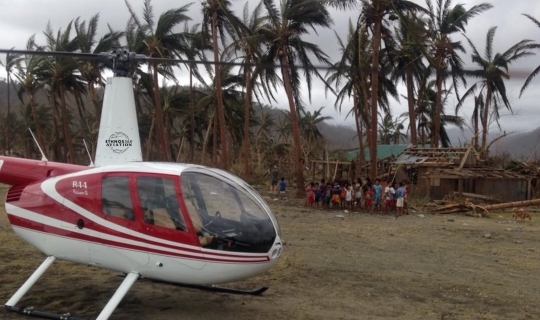 The R44 you prayed for is on Mindanao Island in the Philippines! But keep praying. The paperwork process isn’t finished yet. 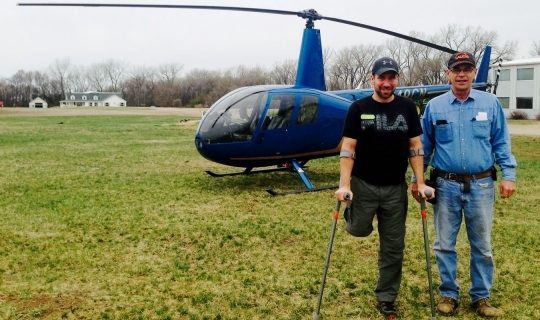 When NTM Aviation pilot Jon Leedahl was involved in a life-threatening motorcycle accident that cost him his leg, it wasn’t only his life that was affected. Read his wife’s testimony. 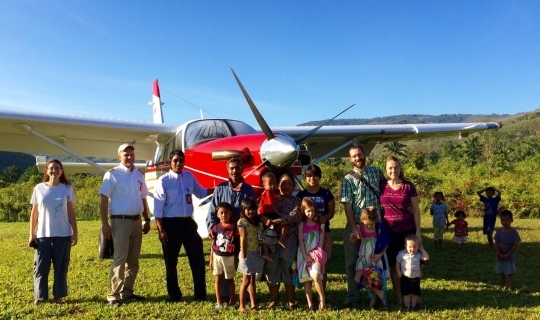 NTM Aviation pilot Jon Leedahl was nearing the completion of his extensive training with SIL (JAARS) in the Kodiak airplane — and God had already miraculously provided two of the three Kodiaks that NTM Aviation needed for Papua New Guinea. 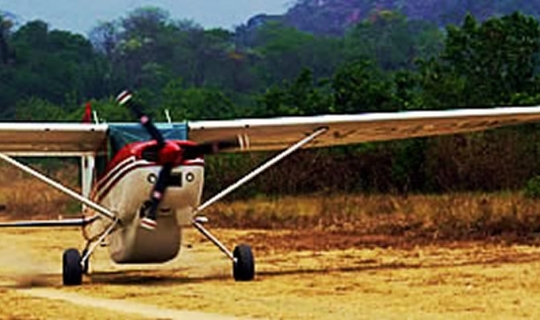 Within a year’s time at least one of the Kodiaks would be on location in Papua New Guinea and Jon would be in the pilot’s seat. Life was good. Everything was going according to plan. 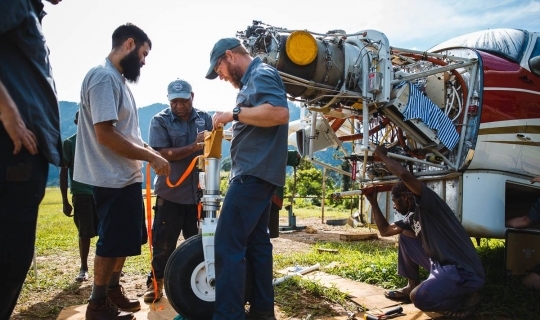 With three Kodiaks in Papua New Guinea arriving far more rapidly than we expected, our urgent attention turns to the remaining setup so the program runs smoothly, efficiently, and above all, safely. 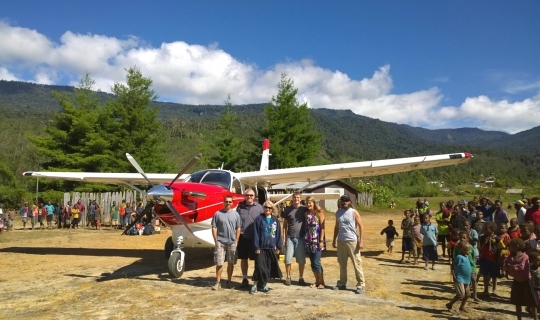 A third NTM Kodiak airplane has been successfully ferried across the sea to Papua New Guinea. You know that wonderful feeling of a promise kept? 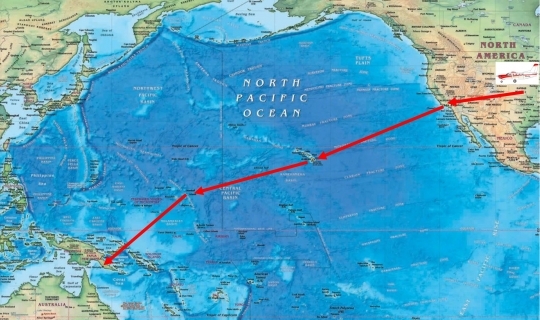 Did you check the weather channel lately to track the winds over the Pacific? 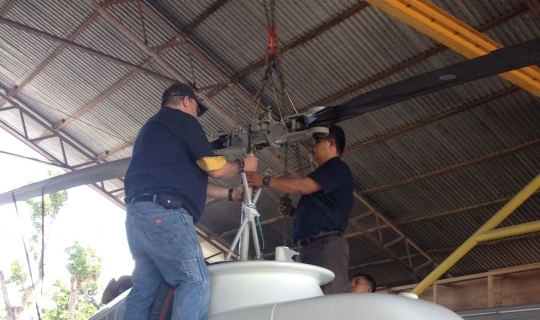 You might have had serious doubts that a shrink-wrapped helicopter could ever be put back together and fly again. 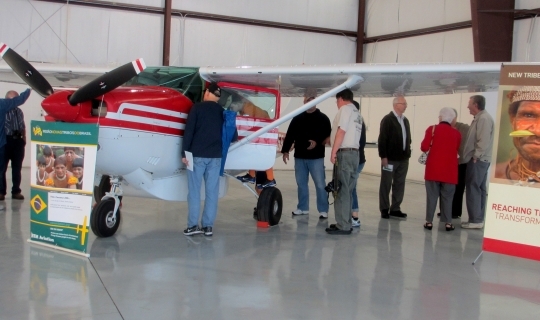 When you get on a plane, do you have the jitters, wondering if the aircraft is totally safe and airworthy? If you visited the hangar at NTM Aviation headquarters in McNeal, AZ, it would seem a little empty these days. 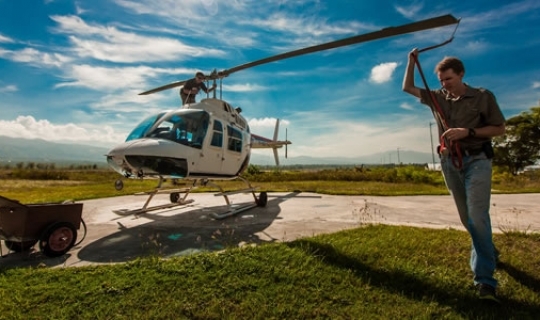 Did you ever see a helicopter loaded into a shipping container? 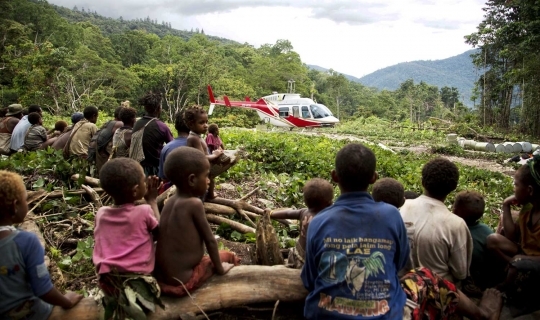 David and Shari Ogg have lived in the jungle since 1991 when they located among the Simbari people of Papua New Guinea, in a village accessible only by air. Kodiak #2 Arrives Just in Time! Your prayers were answered! After thousands of miles of flight across the Pacific, ferry pilot Leon Stoman touched down on Papua New Guinea soil with Kodiak N111KQ! 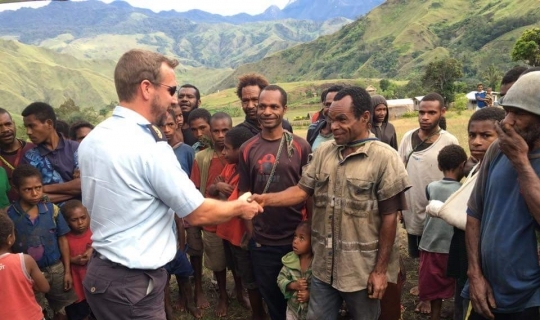 The airplane is expected to arrive in Papua New Guinea today. Thanks for praying. Kodiak N111KQ made it to Hawaii yesterday! God who stills the winds and the waves will make a way! 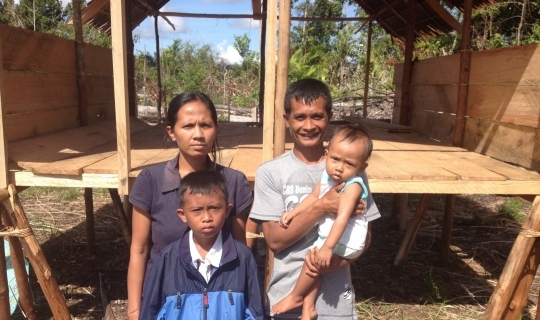 For Philippine national missionary Rudy Barlaan, Bible translation is the heart of the matter. Glowing from the rising sun, the second Kodiak bound for Papua New Guinea departed January 11 for Wichita, Kansas..
Can a medical team traveling to an out-of-the-way island of Asia Pacific make a difference for Christ? Steffan Pyle, manager of NTM Aviation in Asia Pacific, certainly hoped so. 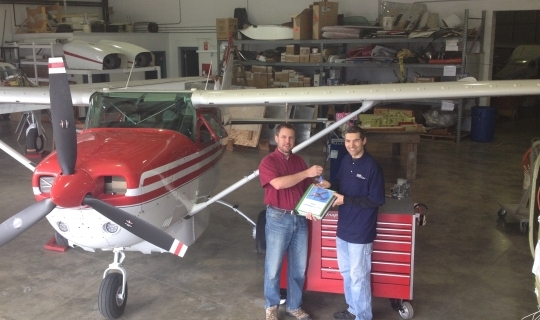 What happens when an NTM Aviation mechanic sees church planting first hand? 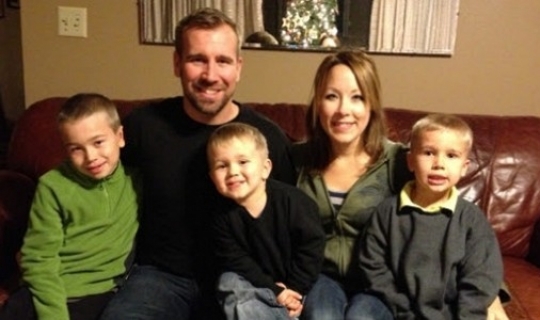 Jon and Adie Leedahl: Great News! As Jon Leedahl climbed out of the Kodiak yesterday, Adie could tell even before he said a word. You will love this news! 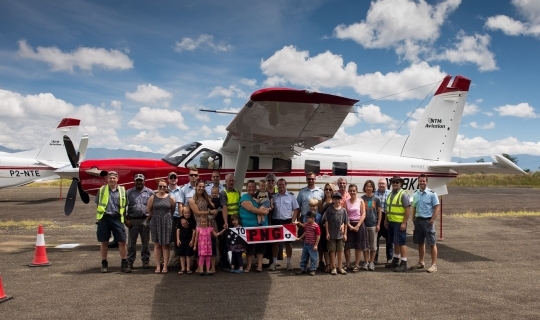 December 1, the NTM Aviation's first Kodiak in Papua New Guinea took to the skies. Just imagine if you had to learn an unknown, unwritten language well enough to present the gospel and teach up through 2 Corinthians. How has God Answered Prayers in 2015? Reflecting on 2015 we are humbled by God’s faithfulness to answer prayer. 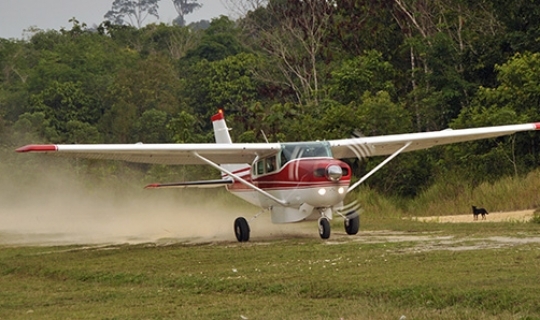 A Cessna 206 was available for a medical evacuation flight after missionaries and others were bitten by a tapir. Have you ever faced a “daunting task”? A couple of years ago, that’s just how missionary trainees Greg and Kadie Reid viewed planting a church in an otherwise overlooked group of people. Let the Flights Begin in Brazil! Did you sense a feeling of relief the last few weeks? Maybe you had an extra dose of joy in your heart? 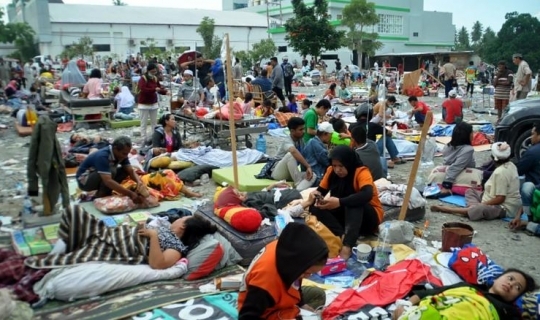 Five communities were in need of immediate help. 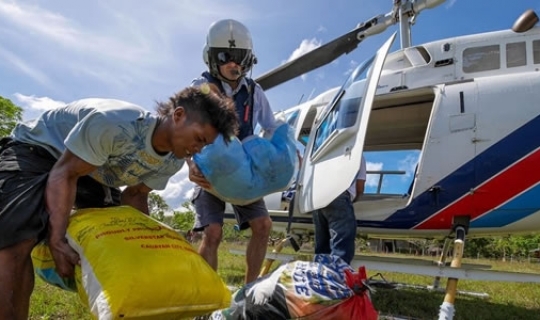 As Typhoon Koppu cut across the island of Luzon October 16 and 17, drenching rains caused washed-out roads and landslides, cutting off villages from food and supply lines. 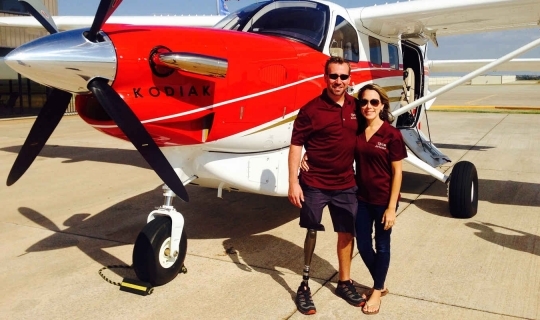 A prosthetic leg isn’t deterring Jon Leedahl from making plans to continue being a missionary pilot. 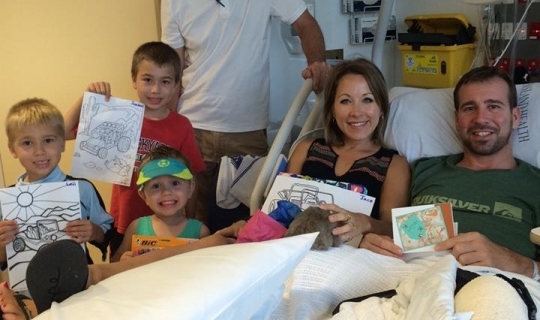 Eleven months ago, Jon Leedahl lay in a hospital bed in Australia. 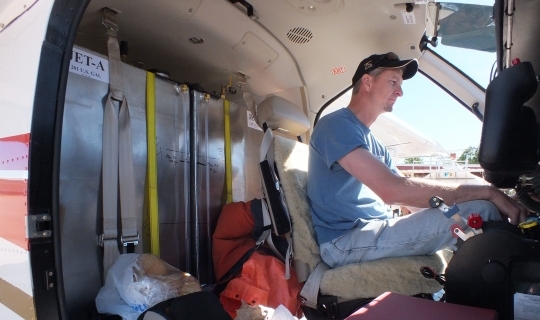 But Monday, it was Jon himself sitting in the right seat, piloting the Kodiak. 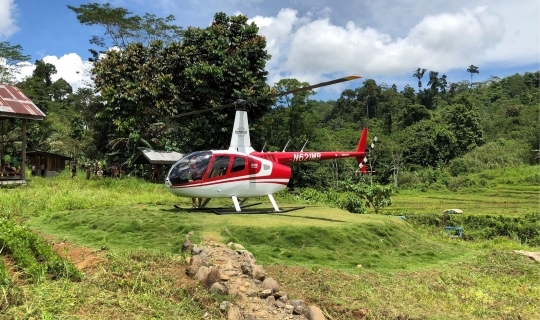 A larger, more powerful helicopter will open more opportunities for church planting in the Philippines. 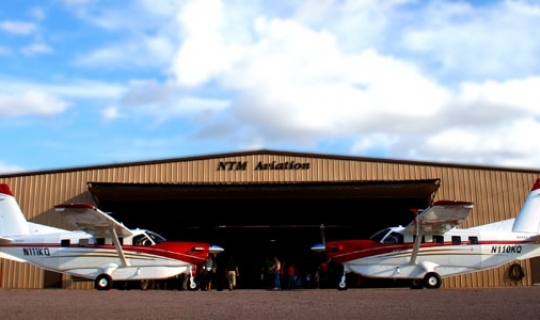 Tomorrow, August 27, 2015 Charlie Patton will fly NTM Aviation's Cessna 206 from one town in Brazil, to its place of ministry. 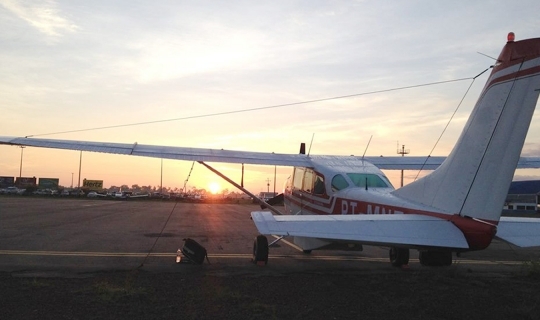 Flight service in Brazil is about to begin after years of work. 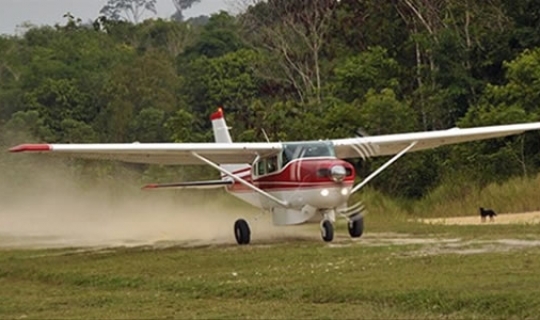 The first in a fleet of three Kodiaks landed in Papua New Guinea. Prayers are needed to complete this fleet. 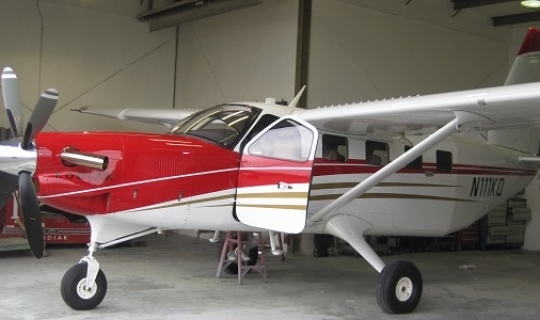 The first of three such aircraft is expected to leave this weekend and arrive next week. 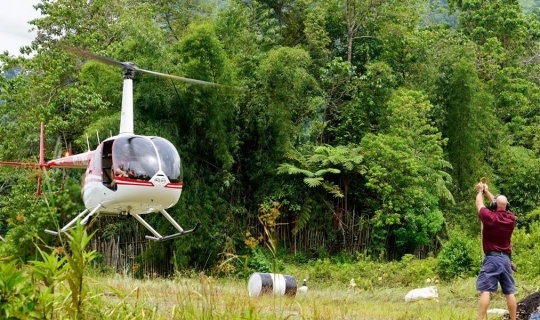 Outfitted to the max with extra fuel tanks, Kodiak N110KQ departs Saturday, July 18, for Papua New Guinea. Don't you love it when dreams come true? 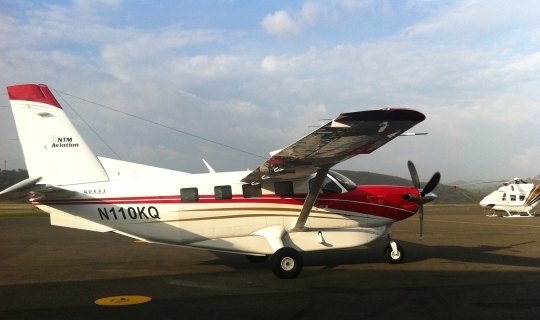 This morning Kodiak N110KQ started its long anticipated journey to Papua New Guinea. You have new brothers and sisters in the Manobo tribe of the Philippines! 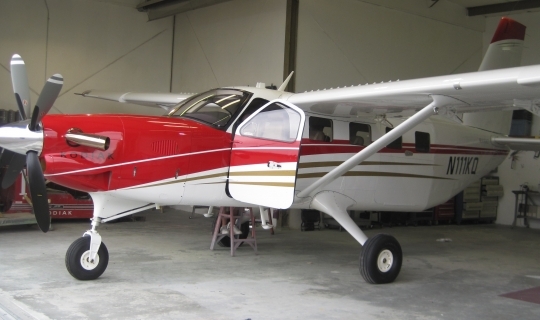 One is ready to go, and a third aircraft has been purchased. Wow! God is So Good. God answered your prayers! 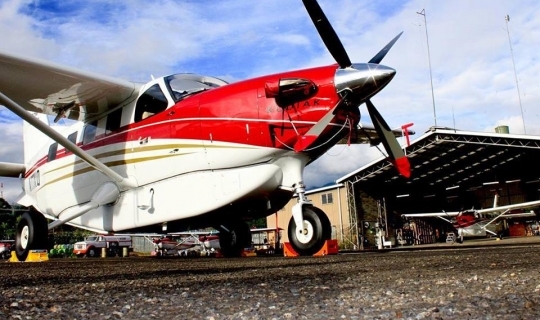 A Kodiak is on its way to Papua New Guinea! The work among the Wana people wasn’t progressing -- until they saw how committed the missionaries were. Blind Curves: God Is Around Every Corner. Thank you! 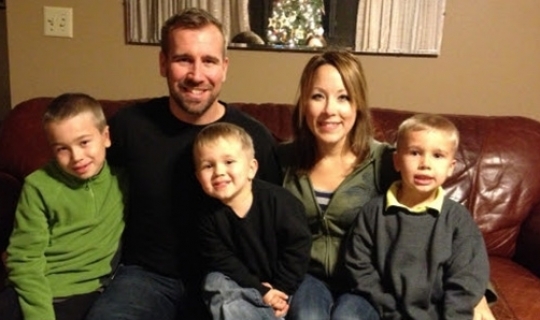 You prayed for NTM Aviation pilot Jon Leedahl and his wife Adie, and they feel the results. "So many answers to prayers -- right away & right before our eyes!!" rejoices Adie. Good news! 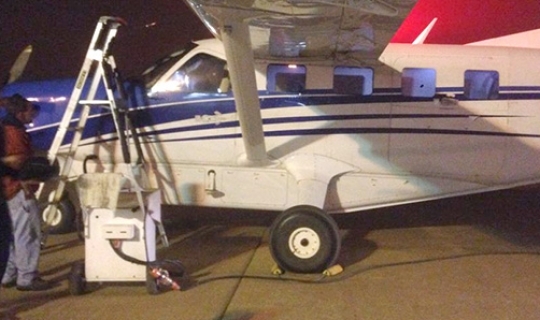 The Cessna 206 that had just landed in Brazil. 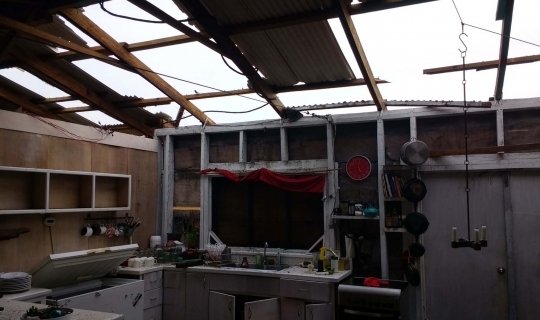 There's one life-saving lesson NTM needs your help to apply in the wake of another typhoon strike in the Philippines. Your prayers are needed! 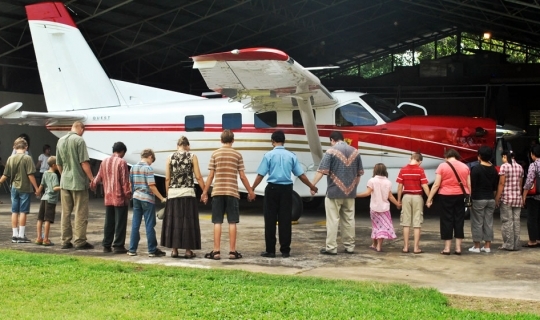 The Cessna 206 that many of you have prayed for and invested in over the years made it to Brazil November 26. Last Saturday in Sanford, Florida, the celebration language was Portuguese! 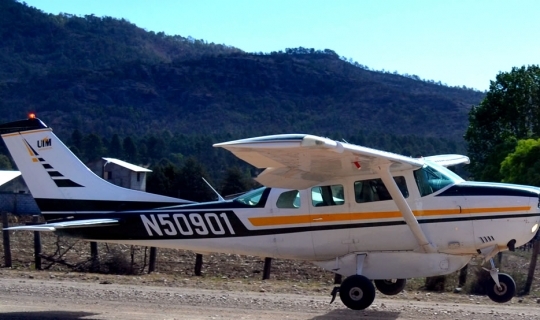 A Cessna 206 is on its way to Brazil to serve missionaries who are bringing God’s Word to remote villages. You can help contribute $10,000 simply by voting for New Tribes Mission now. 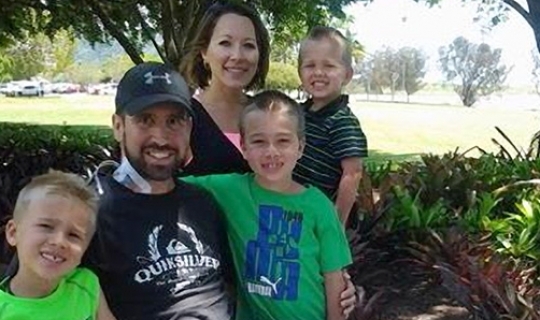 Jon Leedahl lost his leg but his life was saved after a serious accident in Papua New Guinea. 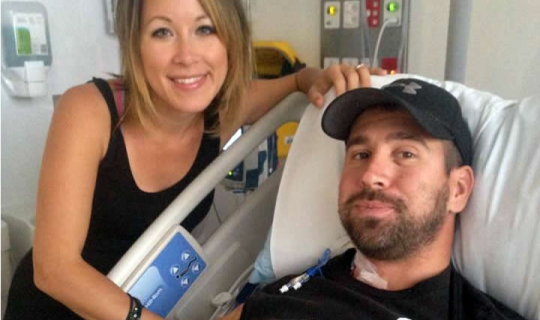 Following Jon's surgery yesterday, Cam Leedahl, Jon's mother reports, " Thank you for your prayers! Jon's knee surgery went well today. 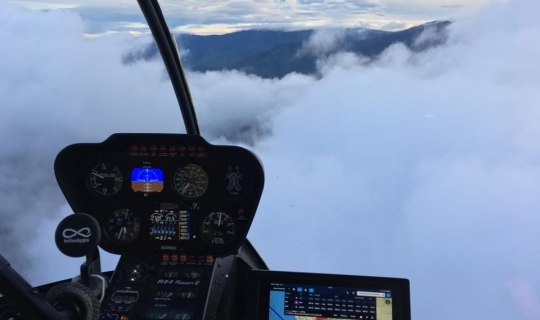 It was a beautiful scene in NTM Aviation pilot Jon Leedahl's hospital room in Cairns, Australia, Thursday morning. 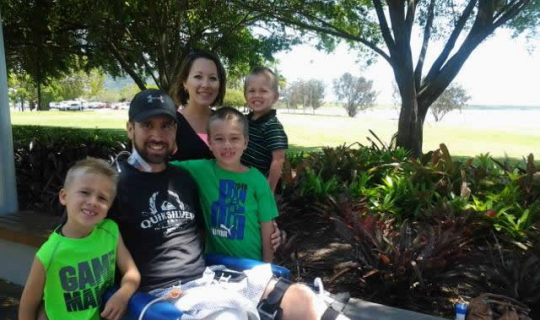 Monday morning in Cairns, Australia, Jon had surgery to clean the wound from the amputation of his right leg, and it went well. 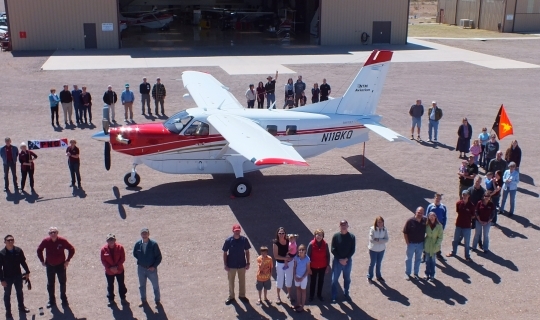 Thank you for your continued and fervent prayers for pilot Jon Leedahl. 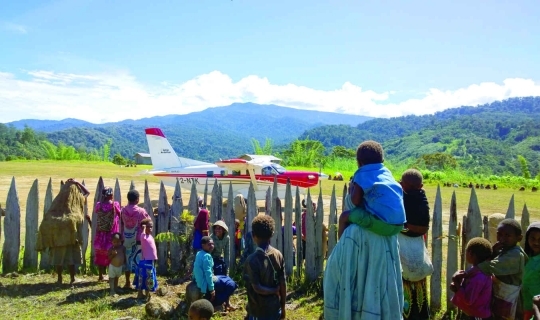 Wednesday afternoon the 15th of October (local time) in Papua New Guinea, NTM Aviation pilot, Jon Leedahl, was involved in a life-threatening road accident on his way home from the hangar where he had been working. The news was not what anyone wanted to hear. 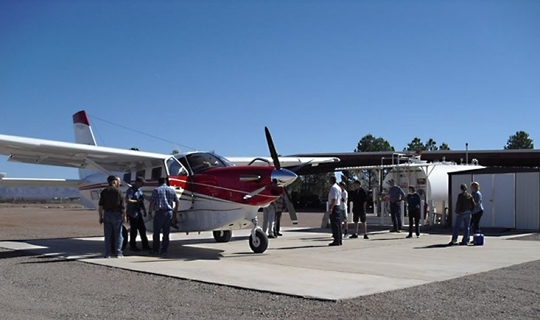 The second of three Kodiaks needed to serve missionaries in Papua New Guinea has arrived at NTM Aviation's facility in McNeal, Arizona. 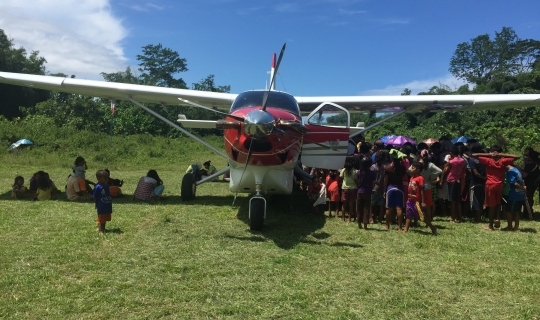 We are so thankful for God’s provision of this 2nd aircraft that will help us serve the tribal missionaries in the very remote areas of Papua New Guinea. Kodiak #2 for Papua New Guinea! 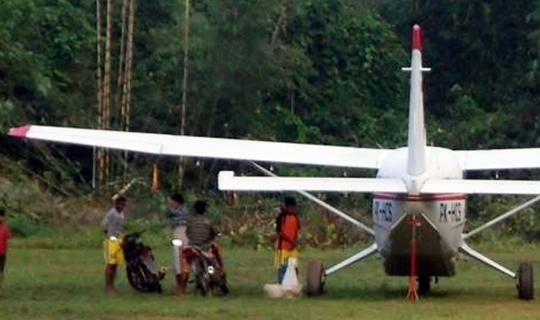 For missionaries in remote villages, the plane is their taxi, delivery truck and, at times, their ambulance. In another astounding turn of events, God has provided a second Kodiak for PNG! 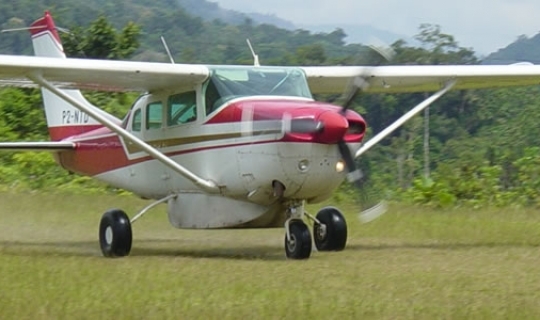 A Cessna sustained significant damage in an incident last week in Papua New Guinea. After a long wait, it becomes increasingly clear that God’s planting and harvesting timetables are perfect. 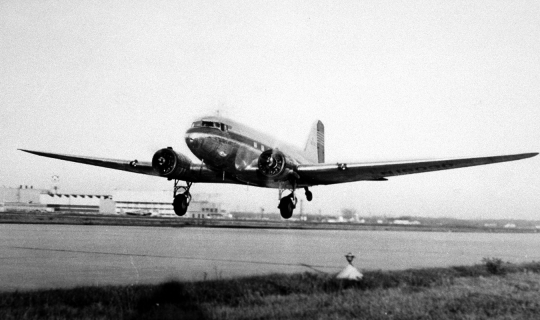 One man's journey marks the beginning of NTM Aviation. 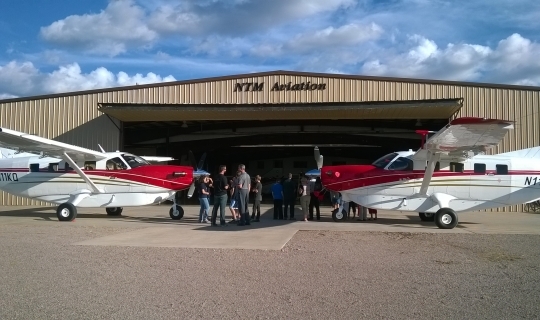 NTM Aviation Welcomes Brand New Kodiak Today! 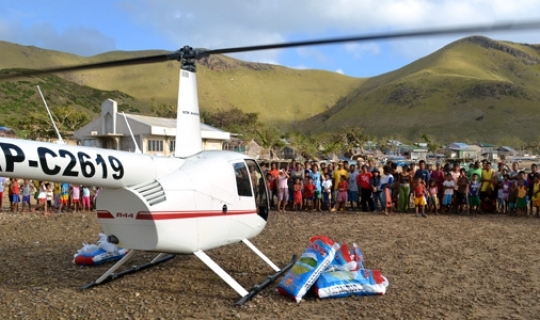 Though a Kodiak for Papua New Guinea still seemed an impossible dream last year, it is now a reality! 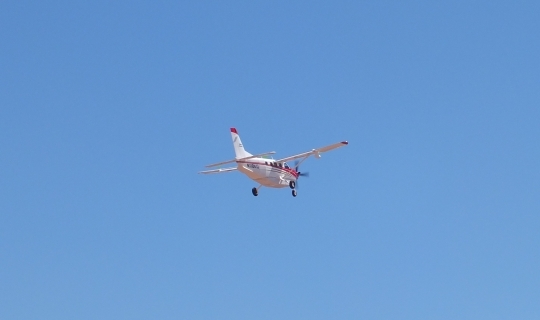 Cessna 206 One Step Closer to Brazil! 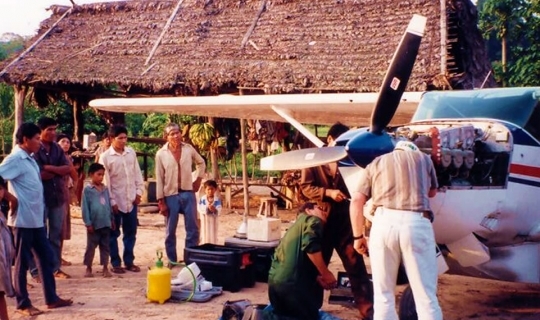 For missionaries in the acre region of west brazil, lack of aviation service means that any trip into the jungle could be their last. 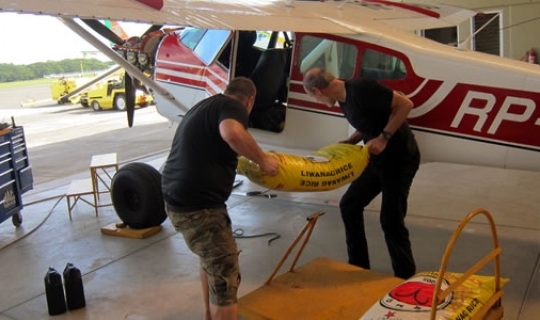 Now the challenge it to get the first of several such planes needed in Papua New Guinea out to the field. Kodiak for Papua New Guinea! A bold step of faith was rewarded. 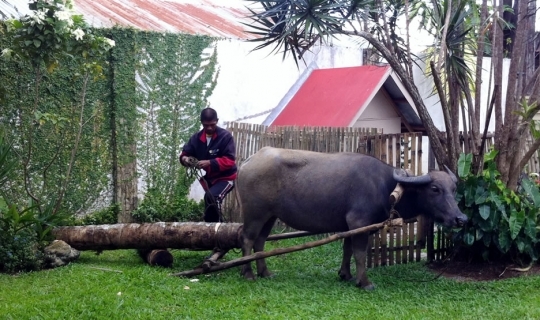 Missionaries invest their lives in something of eternal value—and sometimes it’s fun, too. 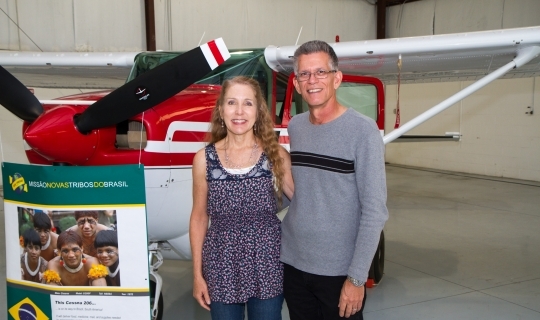 For three years, Charlie and Ruth Patton have been working to bring NTM missionary aviation service to Brazil. 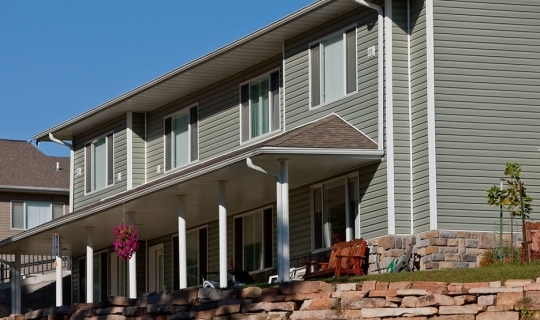 After years of prayer and preparation, the time to live in a village is finally here. 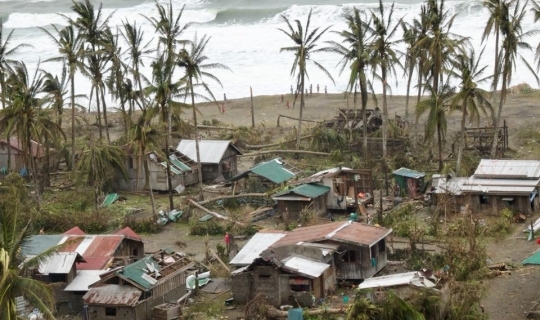 Even in the face of suffering and loss, God is faithfully at work in ongoing Haiyan disaster relief. 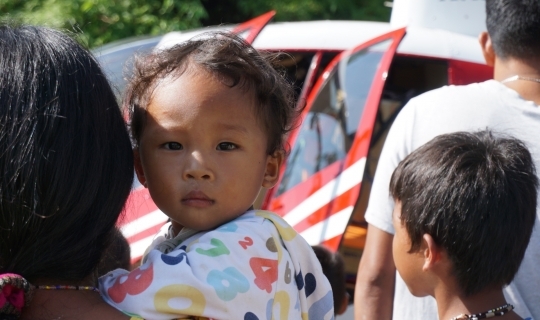 Disaster relief has many faces and is full of opportunity. 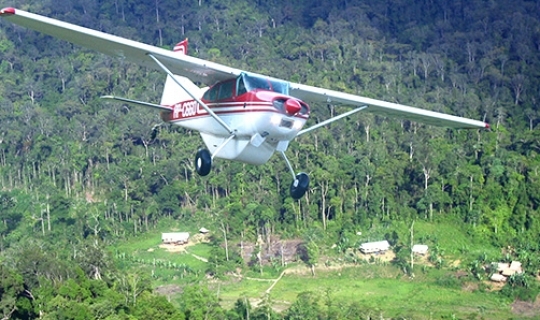 God is blessing thousands of people in the Philippines through missionary aviation ministries. What does relief look like? 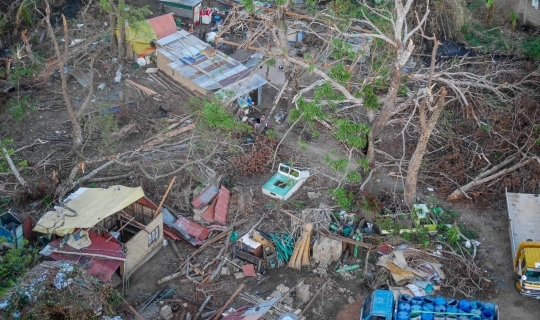 How you can pray for the ongoing relief effort in the Philippines, and help speed response to future disasters. 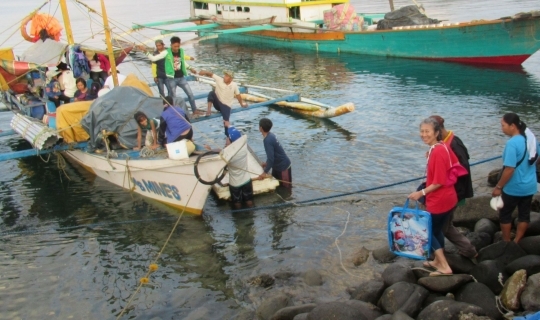 Missionaries are diligently meeting needs in the aftermath of Typhoon Haiyan. 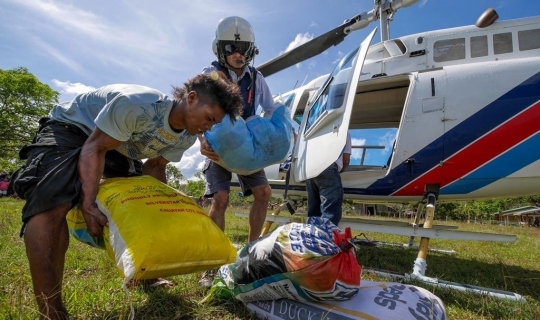 Additional aircraft and personnel are in place to bring help to typhoon survivors. 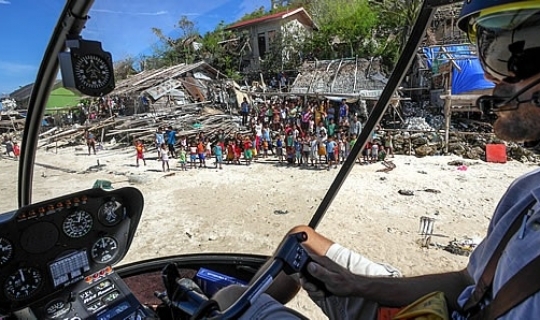 NTM Aviation is working with MAF, HeliMission, and the Filipino local churches to find small, isolated islands without aid after the devastating typhoon one month ago. 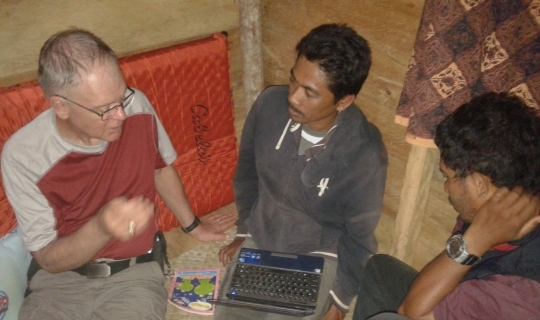 Brian Helmuth’s heart is set on the goal of helping bring the gospel to tribal people. 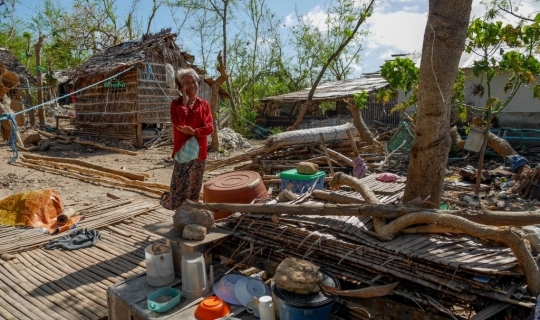 The widespread devastation in the wake of Typhoon Haiyan means the needs are huge and ongoing. 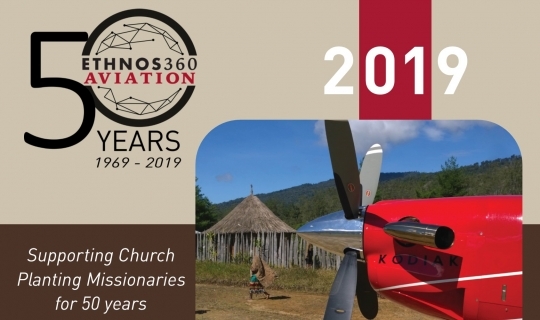 Missionary Steffan Pyle shares his heart for missionary aviation’s contribution to Bible translation. 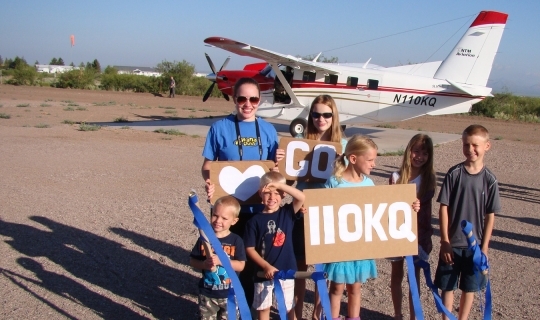 NTM Aviation missionary pilot Zach Keller wanted to be sure people know how much their help is appreciated. 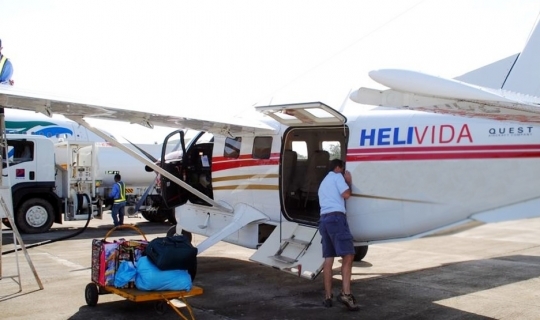 NTM Aviation's personnel, two airplanes and one helicopter are in position to assist typhoon victims on remote islands. 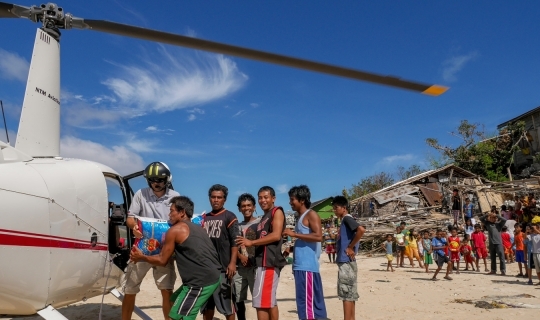 NTM Aviation is continuing to provide assistance for the relief effort in the Philippines. 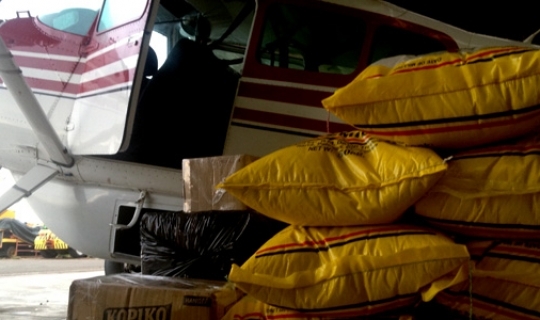 NTM AVIATION IS POISED AND READY TO FLY RELIEF SUPPLIES to hard-hit areas of the Philippines. 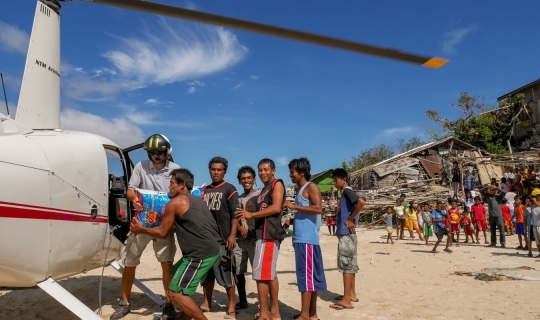 A need for help in the flight program in the Philippines has been met. Dennis and Valerie Easton are doing their best to carry on their ministry from a small town near the people they serve. 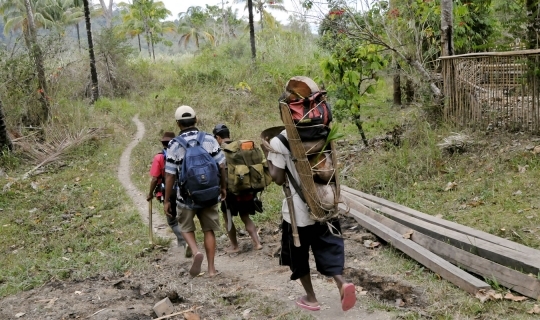 Three hundred Taliabos worked to rebuild the airstrip in their village. 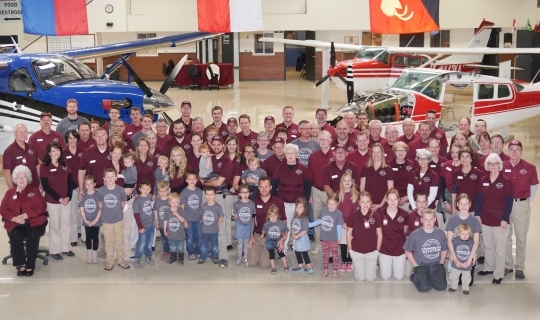 Missionary aviation work is demanding, dangerous and constantly changing, and more of the right people are needed. 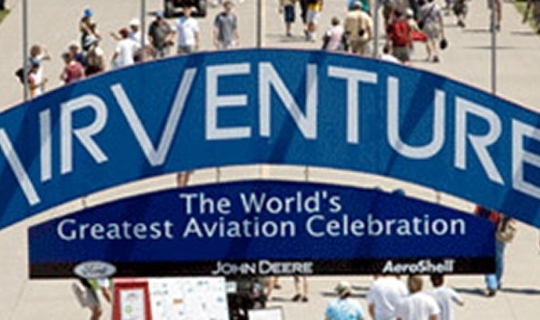 NTM Aviation finds opportunities to help people get involved at the USA's largest airshow. 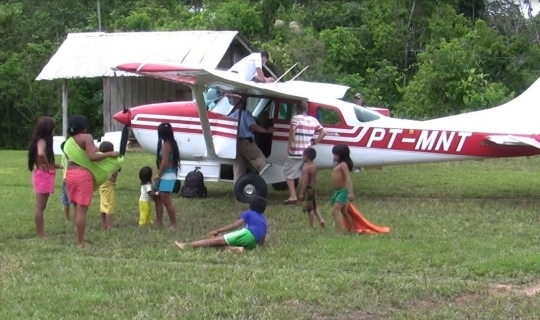 Missionary aviation makes a big difference for missionaries in a remote village. 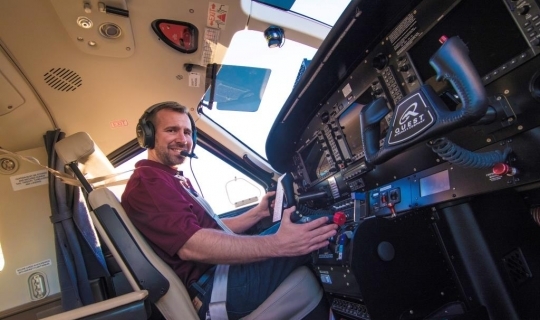 Home assignment is no vacation for missionary pilot Steffan Pyle. 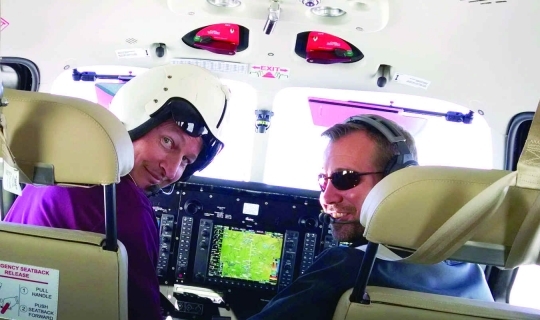 Missionary pilot Clif Huntting aims to save missionaries time and effort by helping to offer flight services. 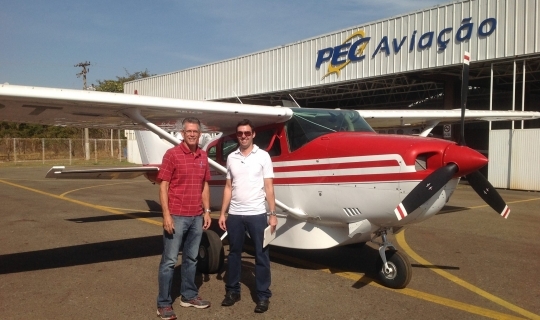 Missionary pilot Daren Spence has been asked to be international chief pilot for NTM Aviation. It really is worth it all! 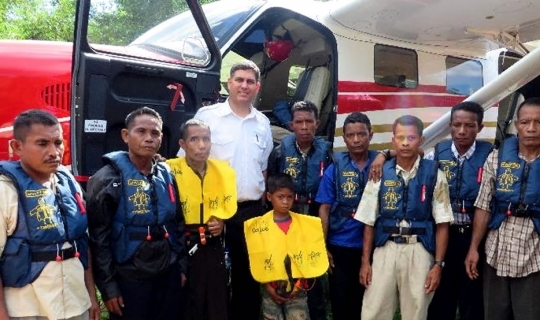 Missionary pilot Josh Dalton shares the greatest joy of missionary service. 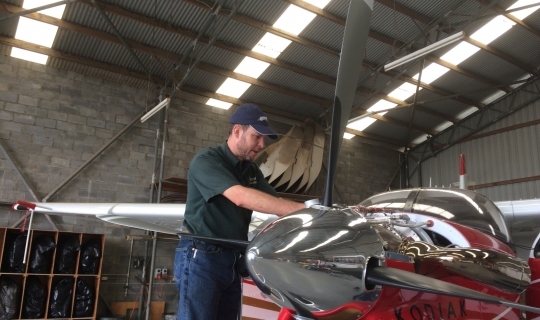 Due to a shortage of pilots, fuel and finances, Lourens Laureti had just one choice. How far would you hike for fellowship? Missionaries head into a little more adventure than they had planned. Several New Tribes Mission projects have strategic importance in reaching tribes and transforming lives. 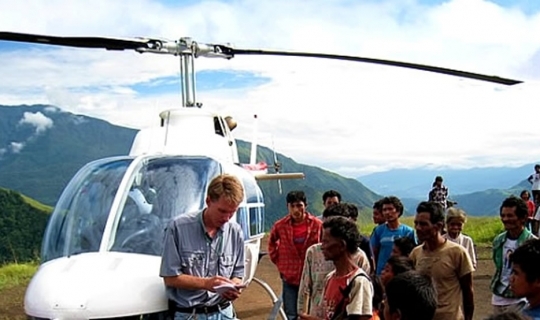 Several New Tribes Mission projects are almost completely funded. Would you like to help push one over the top? Charlie and Ruth Patton depend upon God's timing and trustworthiness. 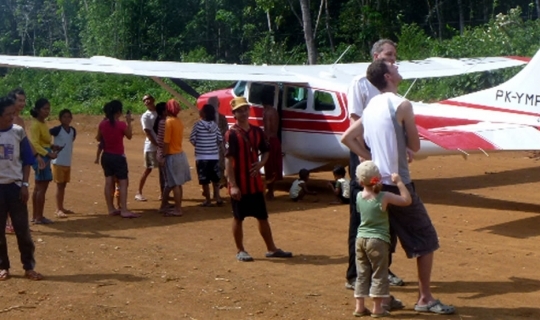 Church-planting efforts in remote tribal villages often rely on missionary pilots. 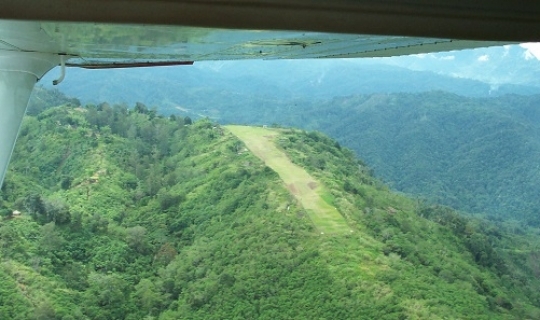 After years of prayer and preparation, a new airstrip is initiated. 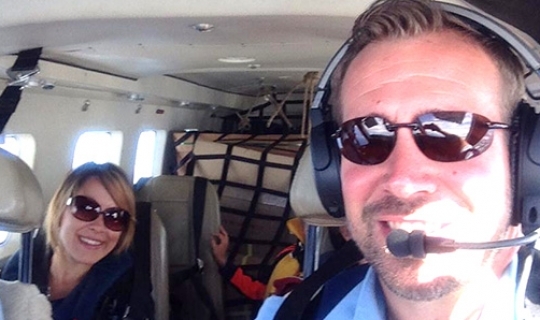 Missionary pilot Mike McGregor says this year has been full of "the craziest situations." Should you call the helicopter? 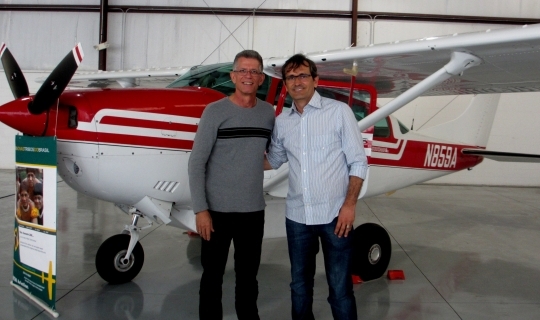 NTM missionary pilot Brian Schaadt shares perspectives from his aviation ministry. Missionaries are grateful for all who have given and worked to make this possible. 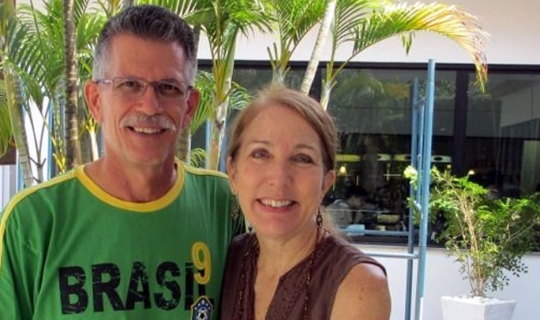 Even in hardships and delays, missionaries Dan and Judy Burke find big cause for thankfulness. The North Wahgi people are preparing to hear and teach about the Bible by learning to read and write their own language. Time and energy are in short supply for missionaries who are weeks away from returning to the USA on home assignment. 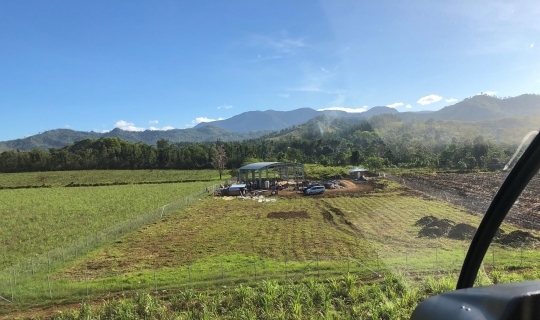 A work team from Australia came to help build a community center that would double as a storm shelter for the Agta people. 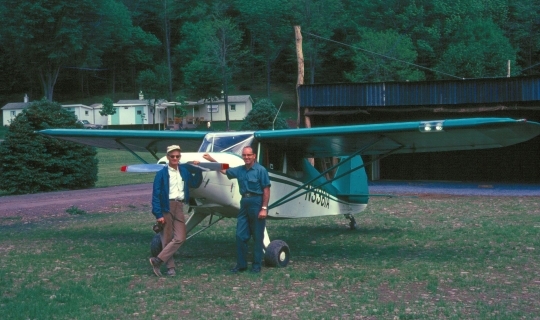 That’s how many times missionary pilot Randy Smyth flew to support missionaries who brought God’s Word to the Akolet people – so far. 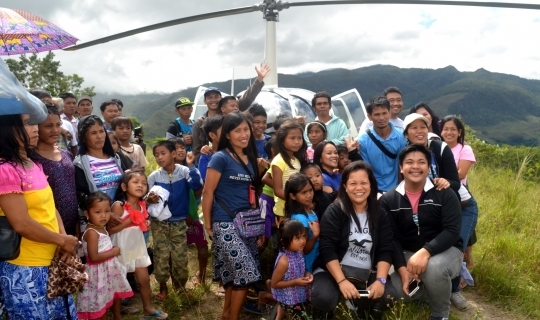 The Dinangat people were "blown away" when they saw the big picture standing in front of them. 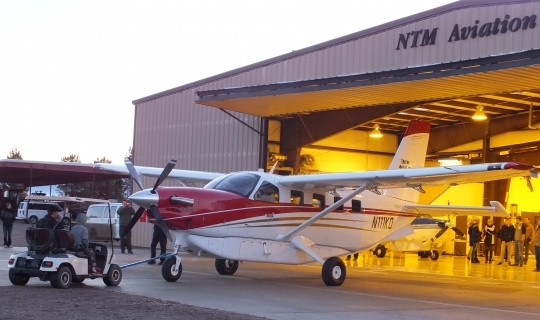 NTM Aviation only has enough fuel for flights through the end of the month. Please pray that a fuel shipment will be expedited. 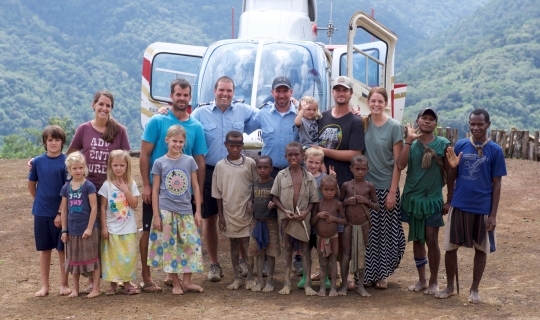 Missionary pilot Mike McGregor gets to spend time with his brothers and sisters. 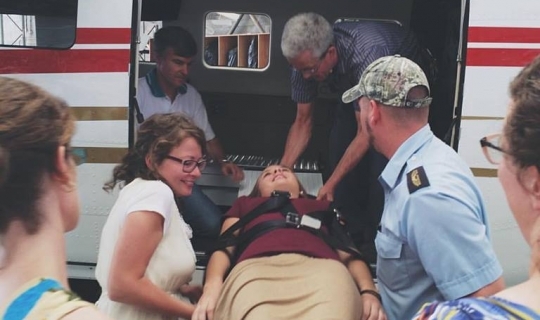 With a flight planned for he next morning, missionary pilot Brian Pruett was thankful for the patient partnership of his wife. 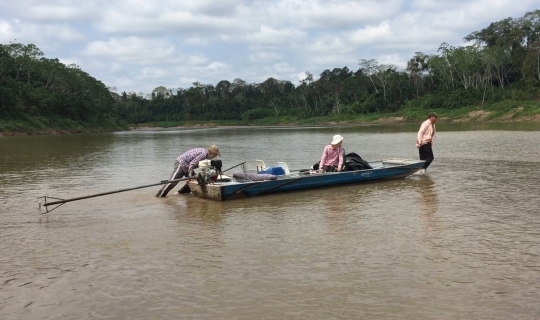 The Higaunon people filled sandbags to make sure a dam held and electricity remained available for printing Bible portions. 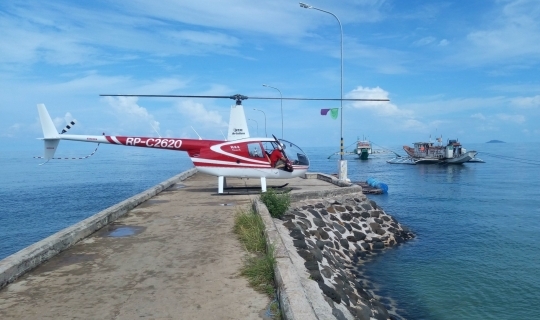 Recent additions provide a more adequate aviation program in the Philippines. Missionaries Ron and Carrie Lindsey returned for a visit to the village where they formerly ministered. 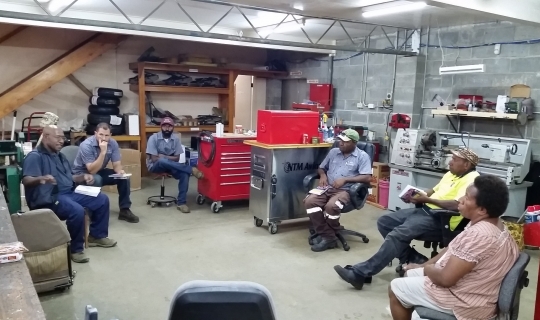 Buying and shipping supplies for remote church planters is demanding work for people such as Joe Evans. 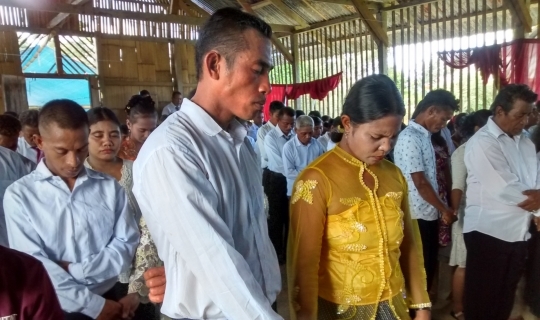 The parents of a 16-year-old who died of tuberculosis are now listening to evangelistic Bible lessons. A mother who had complications in childbirth and her twins are doing fine after a tough journey. 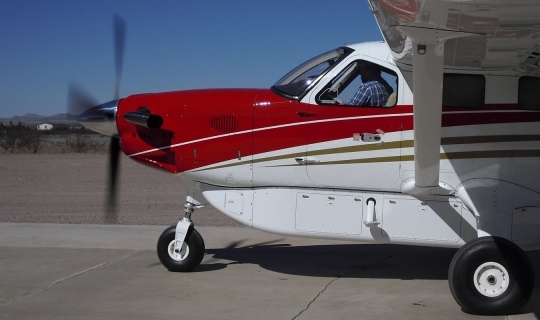 New aircraft will ease some of the burden the aviation team faces. 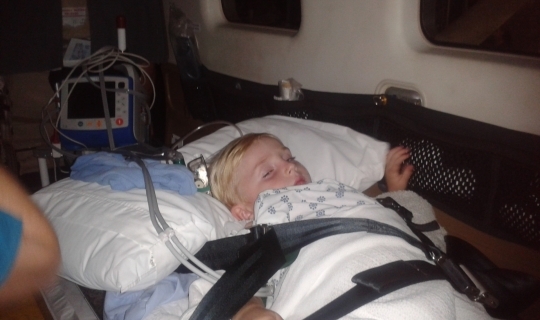 Six-year-old was flown out to a hospital, where he is scheduled for surgery Friday. 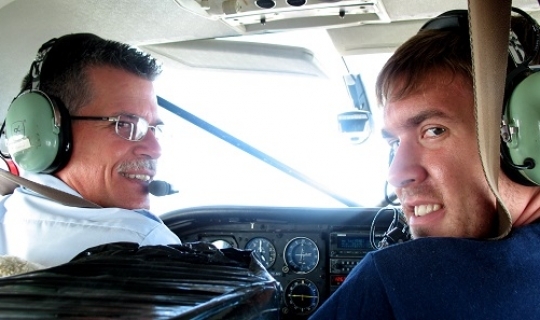 From an early age Brian Pruett was hooked on being a missionary pilot. 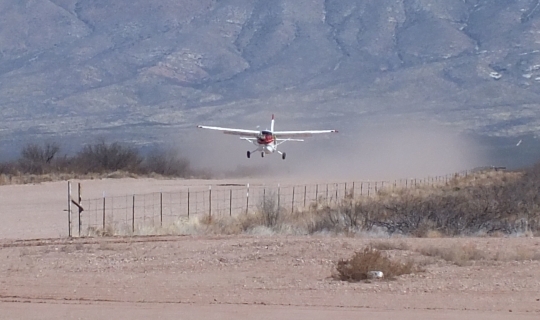 This week his first solo flight flew a couple out for medical care. 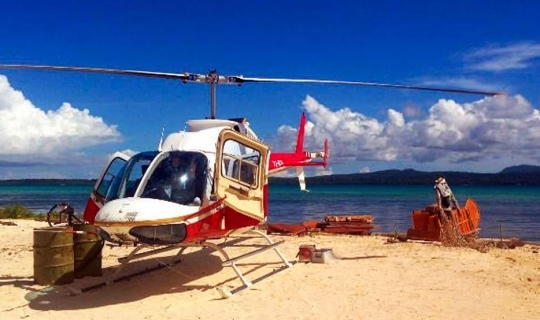 A helicopter used to train pilots will soon be on its way to the Philippines to serve missionaries in remote areas. 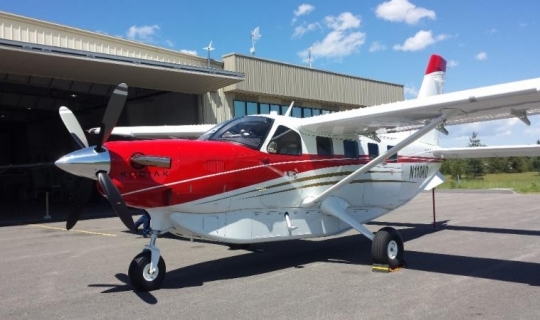 The first of 14 aircraft that will make up the Kodiak fleet was on display in Sanford, Florida, this week. 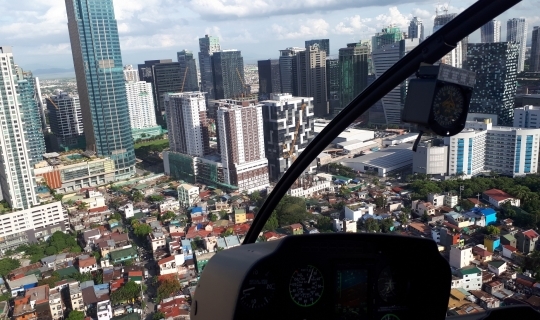 Yuspiter Yambung is scheduled for another interview April 1 as part of the application process for his visa to the USA where he will get additional training to maintain the Bell helicopter. Please pray for the application to be processed in time for the next training session. 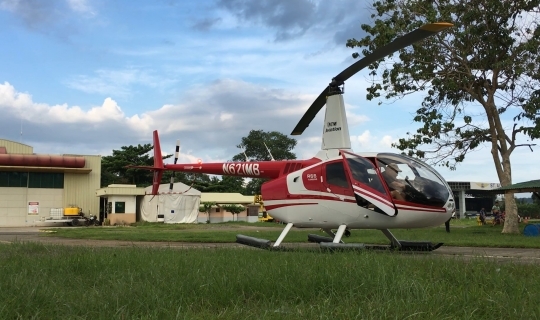 NTM missionary pilot Clif Huntting is finding the needs in Haiti overwhelming. Jane Keller waits for her husband Zach's return while he continues to do medical flights and help where needed. 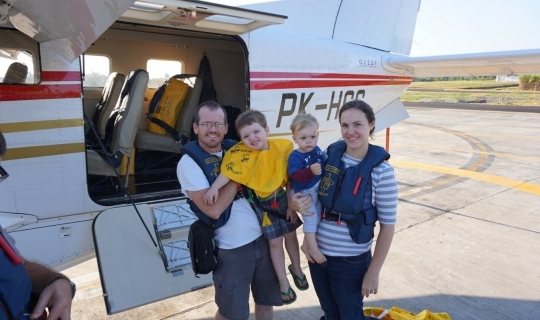 Missionary pilot Zach Keller finds marvels among the difficulties. A tribal village visit lets Emily Henard and other Interface students see the result of all they've learned about planting tribal churches. 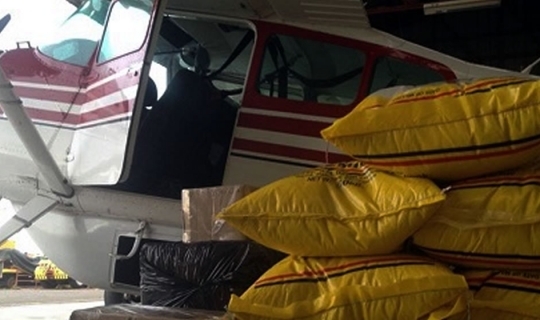 Zach Keller went to Florida to get more flight hours, and got the opportunity to help with relief efforts. The first of NTM’s Kodiak fleet is now being readied to serve in the Asia-Pacific region. 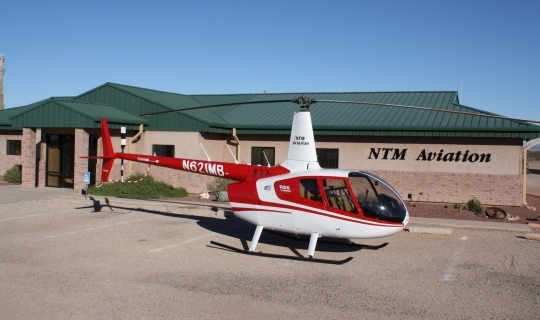 NTM Aviation took delivery last week. 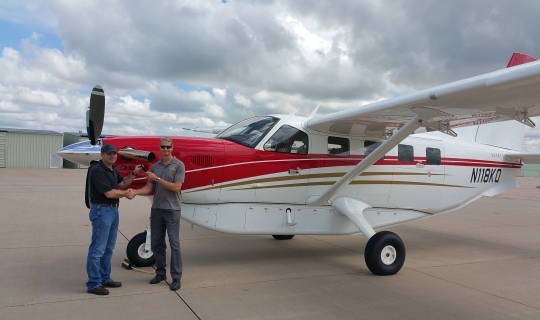 The first of 14 Kodiak airplanes is now in the hands of NTM Aviation's pilots and mechanics, bound eventually for the Asia-Pacific region. 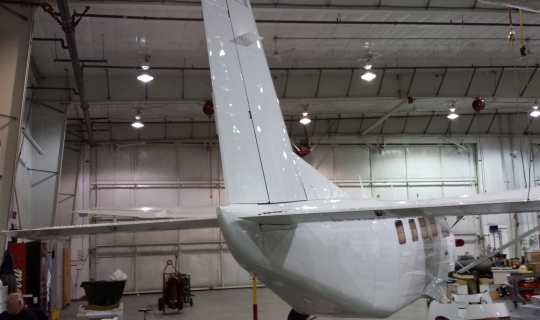 NTM's first Kodiak flew for the first time last week, and is now being painted. 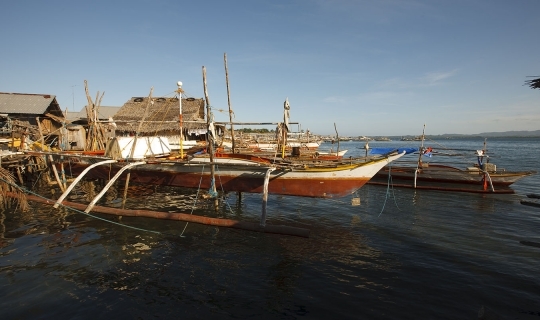 Joel Davis used a boat to help rescue people during recent floods in the Philippines. NTM's airplane of the future is five steps through a seven-stage production process. The children who raised the funds for a Kodiak deposit got to sign part of the tail, which will soon be installed. 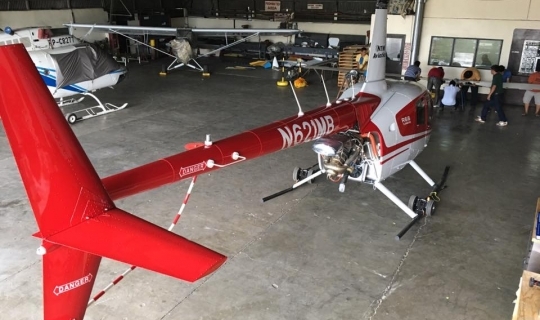 The two, hurt in separate incidents, would have faced a long, rough trip to the hospital without access to a helicopter. Medevac was too late for one man bitten by a death adder. 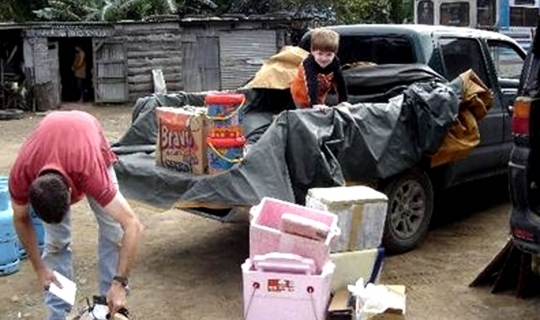 Shuttling supplies to missionaries in a remote village was a lot tougher than expected, but the mission was accomplished. 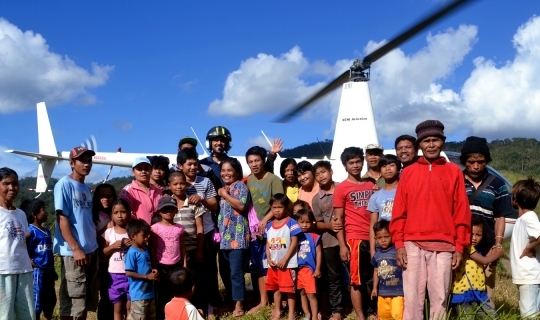 After a long absence, helicopter service is making its contribution to reaching tribal people in the Asia-Pacific region. 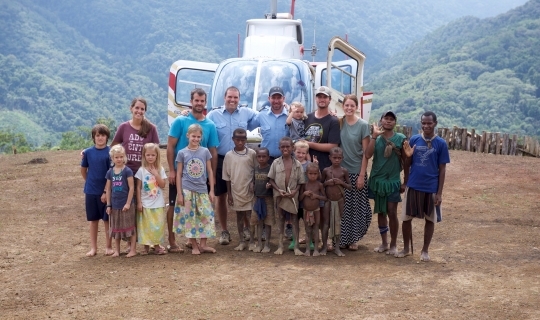 Helicopter maintenance and teaching missionaries' children are crucial to missionaries serving in remote tribal locations. 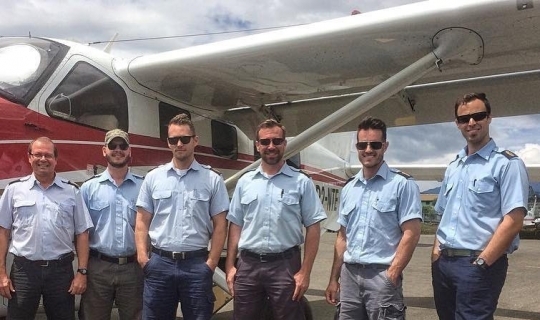 Missionary teachers and aviators look forward to fewer hours and different tasks. 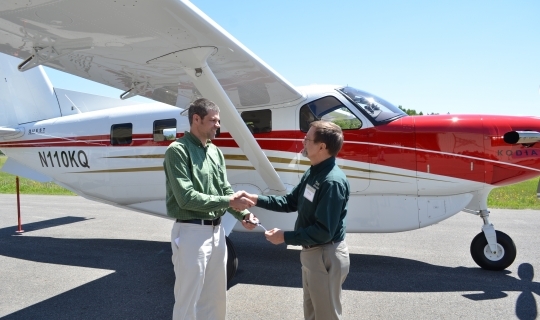 Missionary pilot Brian Schaadt is learning to instruct new pilots. Dan and Judy Burke hold a Bible conference for Chimane believers. Charlie and Ruth Patton are joyful to follow the Lord's leading for their ministry. Twelve missionaries are ready to get involved in ministries that support planting churches among unreached people groups. 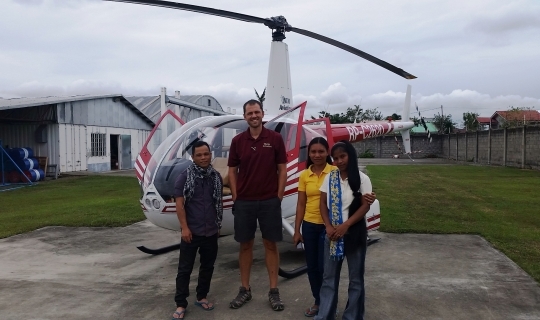 Missionaries Bryan Abbott and Yuspiter Yambung take steps to further their ministry through aviation training. 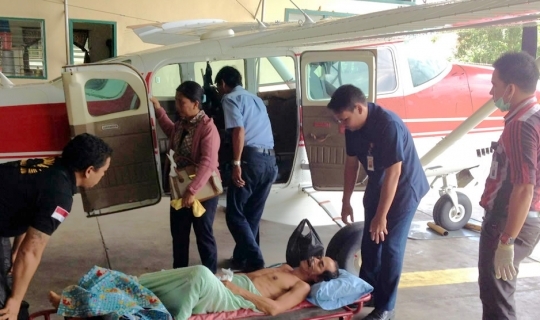 A couple in the Philippines is flown out so the wife can receive medical help not available in her remote Palawano village. 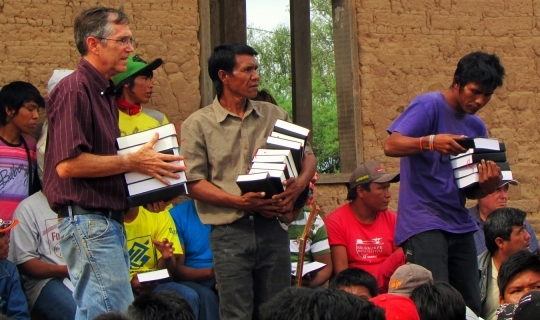 Learning culture and language and adapting to it are two different but connected things, missionaries learn in Bolivia. 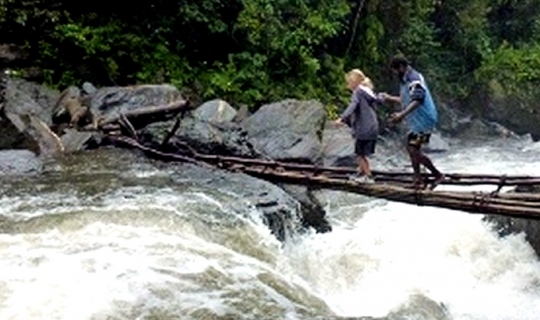 Missionary Linda Krieg ministers all over Papua New Guinea. Yuspiter and Nomad and their families will reunite with family and friends after completing their training with NTM Aviation. 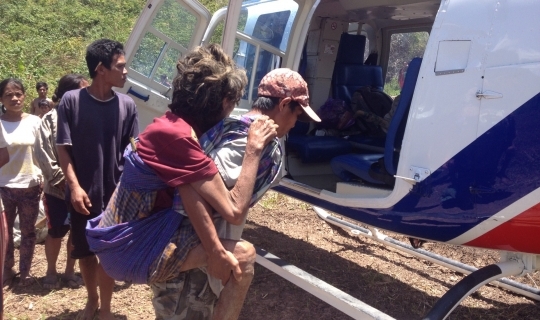 Banwaon believers teamed up to carry a woman 27 miles on a stretcher over muddy, slippery roads when she needed help after giving birth. Missionary pilot Jim Stewart and his wife, Kris, took on other duties to help with a recent translation workshop. 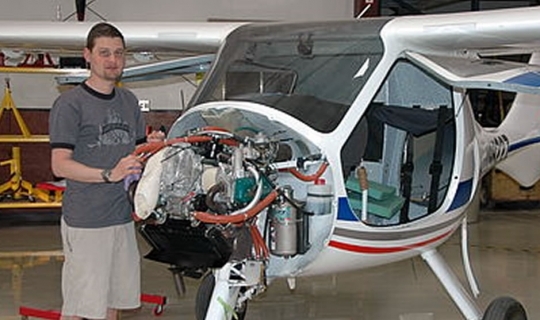 Baptisms, birthdays, and unexpected maintenance make pilot's life interesting. 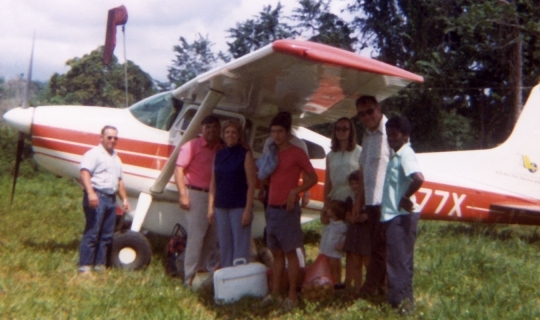 Missionary pilot Paul Wilhelmson waited at the closest airport while a missionary family made an 11-hour trip to meet him. 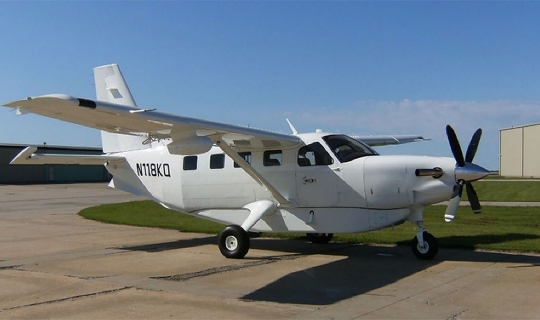 Cessna means Senegal can continue to have air support. God can provide even the littlest things. 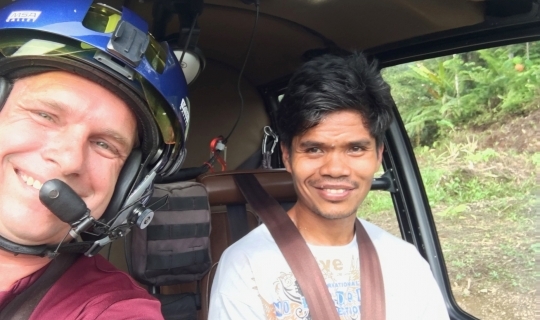 Missionary aviation links missionaries to needed resources outside of their remote communities, and pilots like Charlie Patton are always a welcome sight. 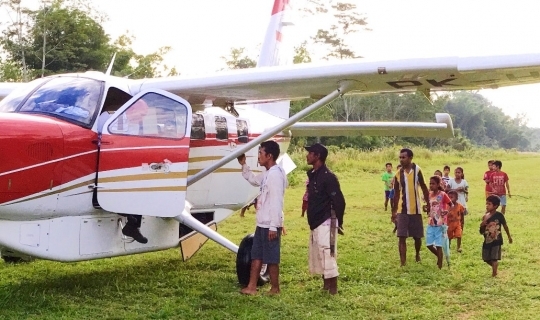 Missionary pilot Dave Douglas landed his plane in a remote village in Papua New Guinea to take a snake-bite victim for emergency treatment. 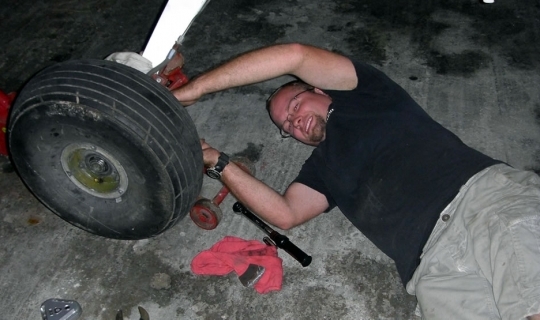 Learning a new language can be frustrating -- and comical -- as missionary aircraft mechanic Bryan Abbott is finding out.